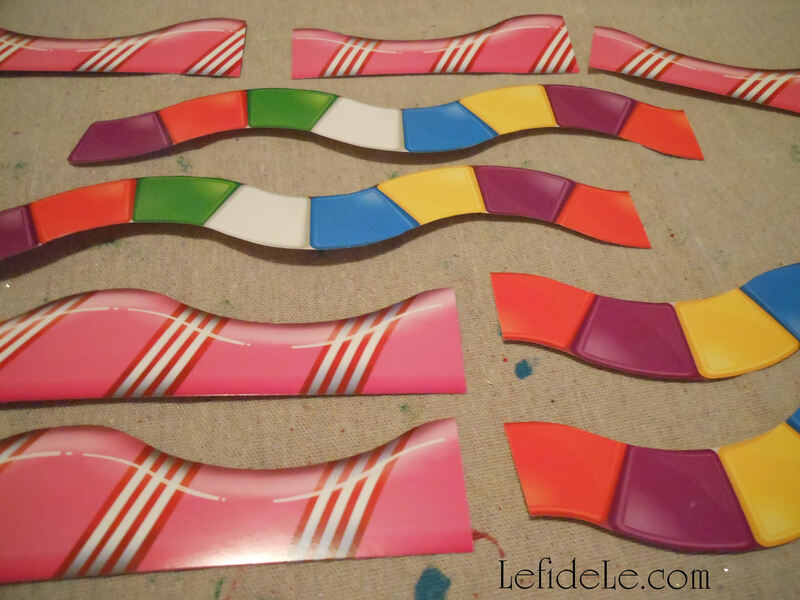 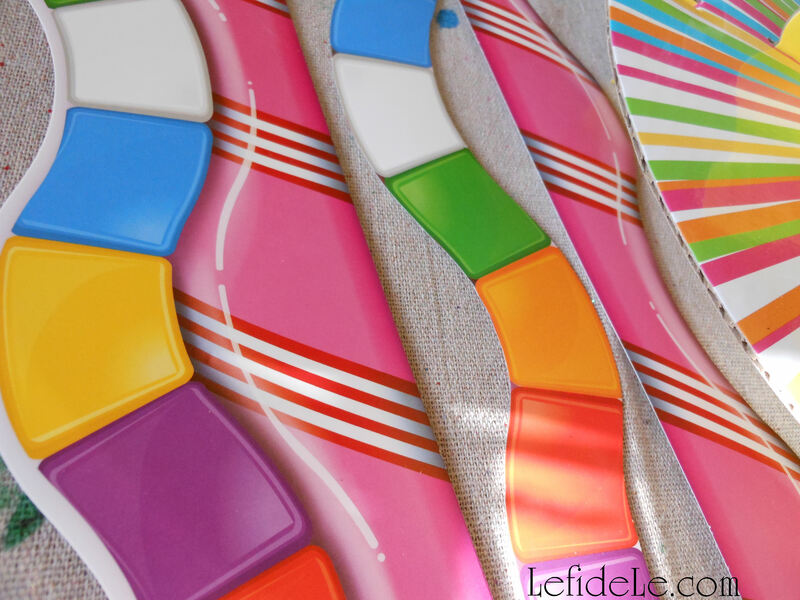 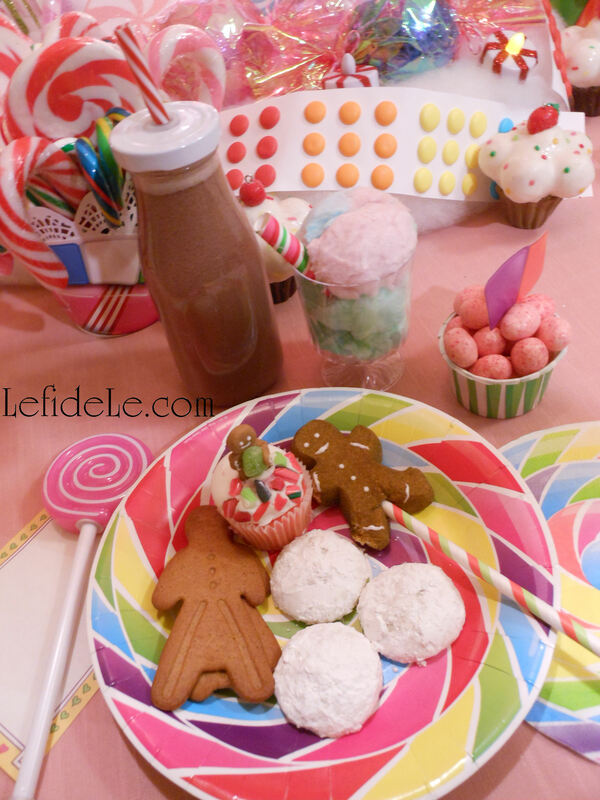 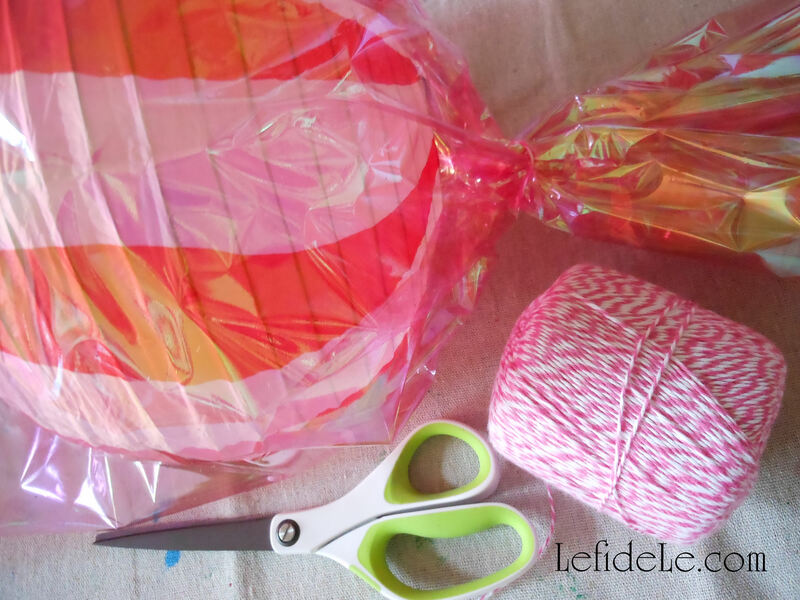 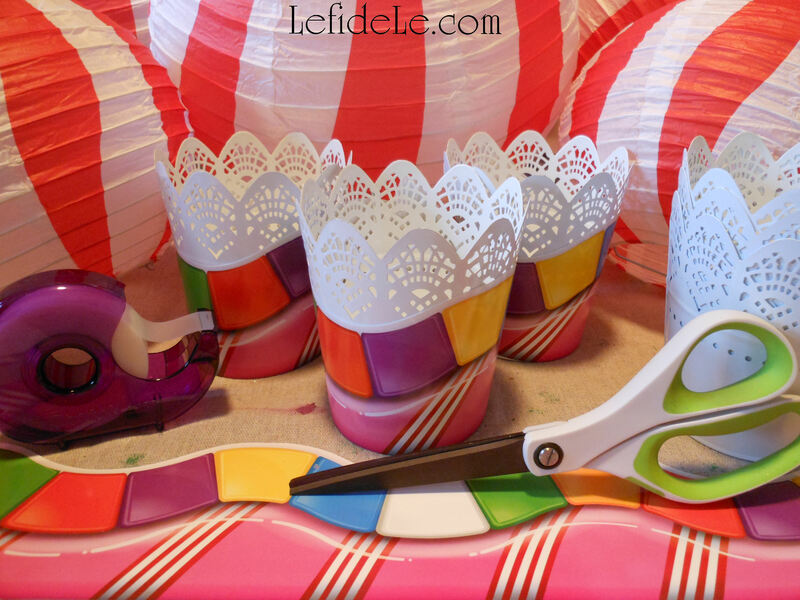 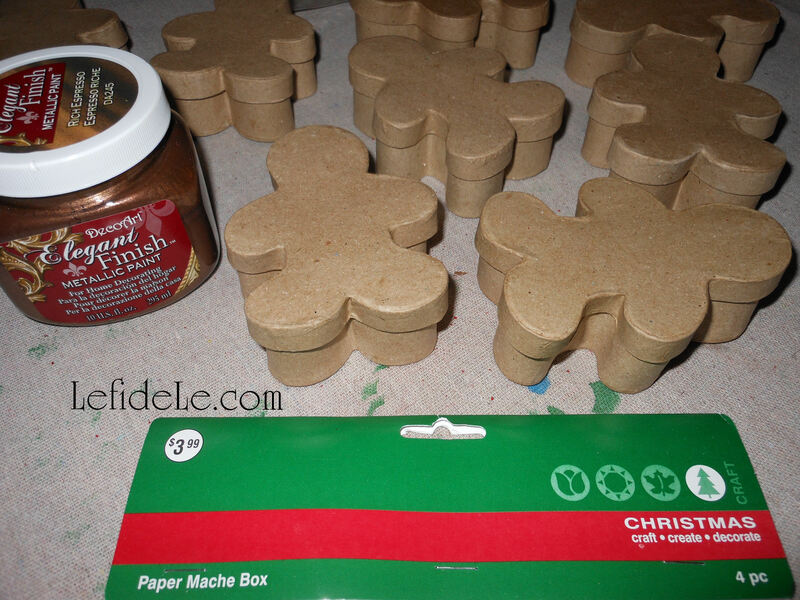 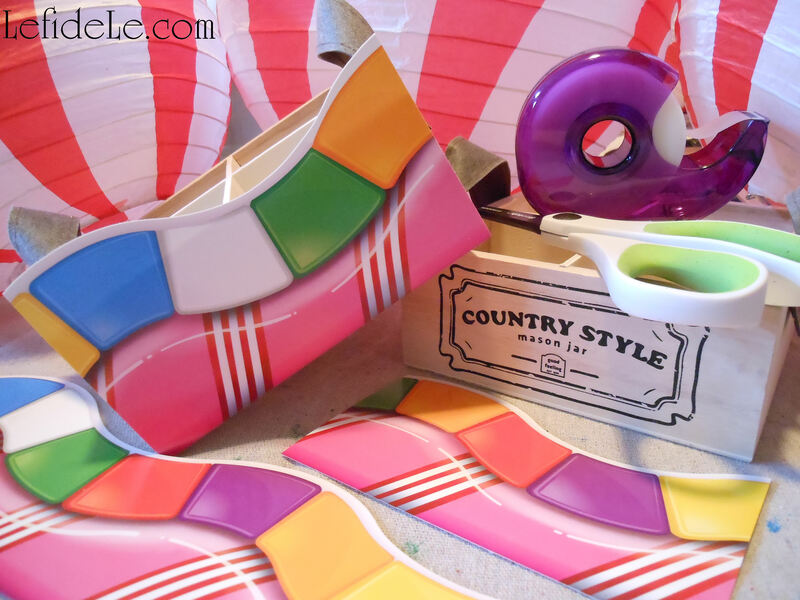 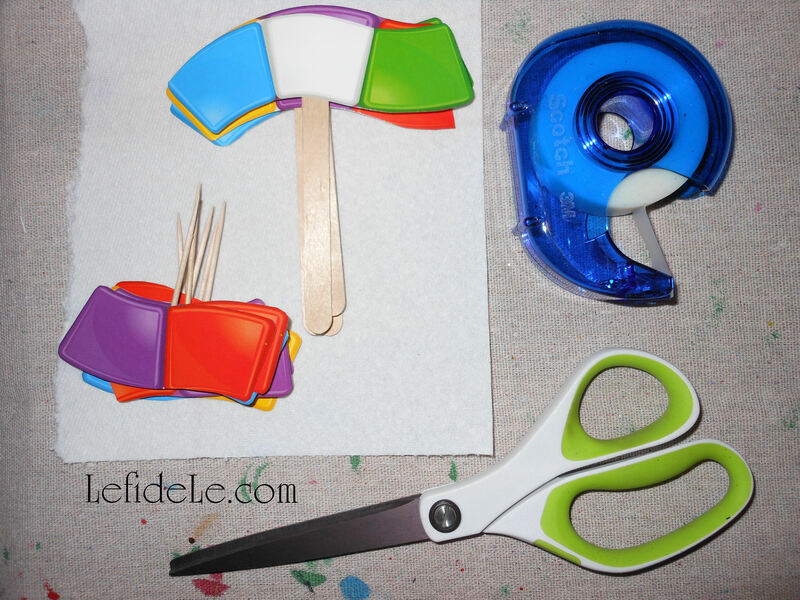 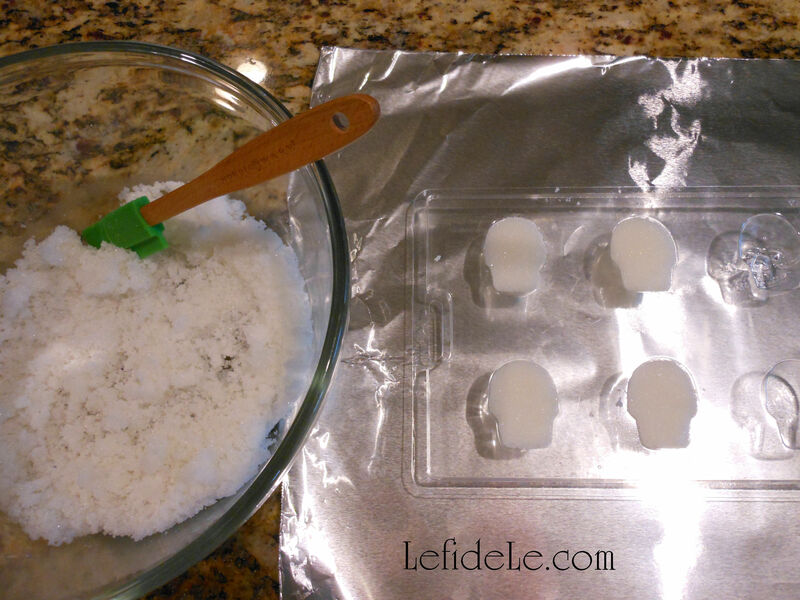 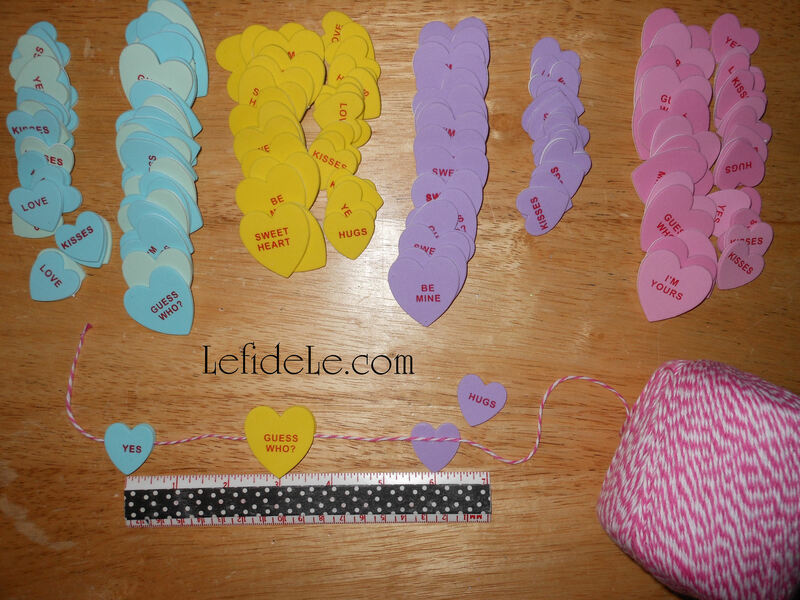 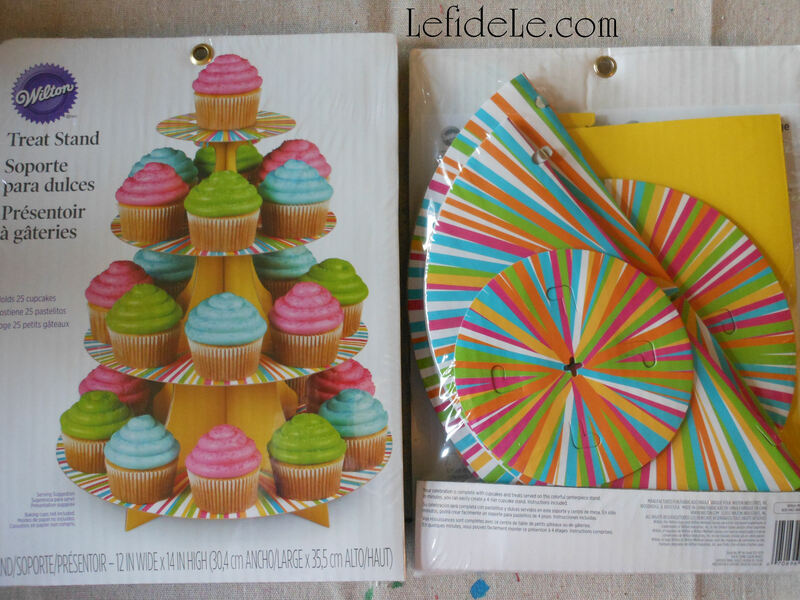 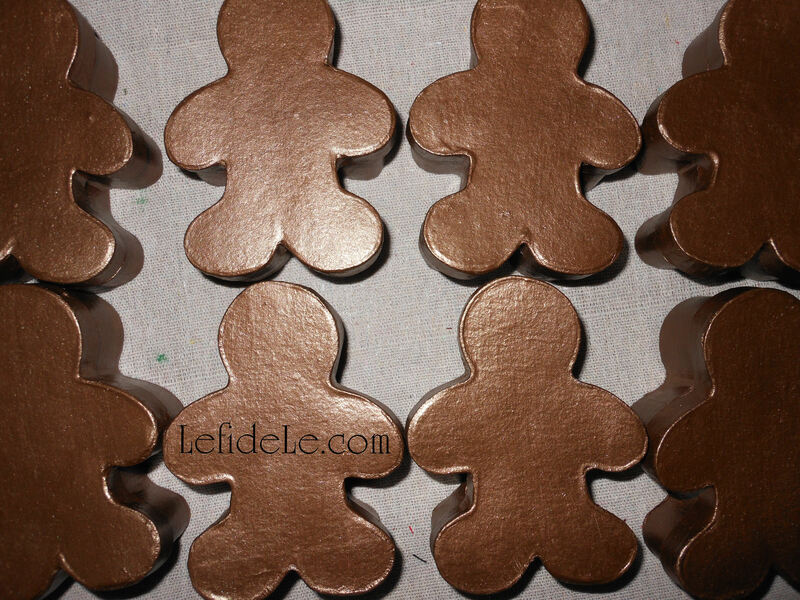 These Candyland party confections are so simple that I thought I’d just combine them into one article… if only to pass along a few easy ideas that can be prepped at the last minute. 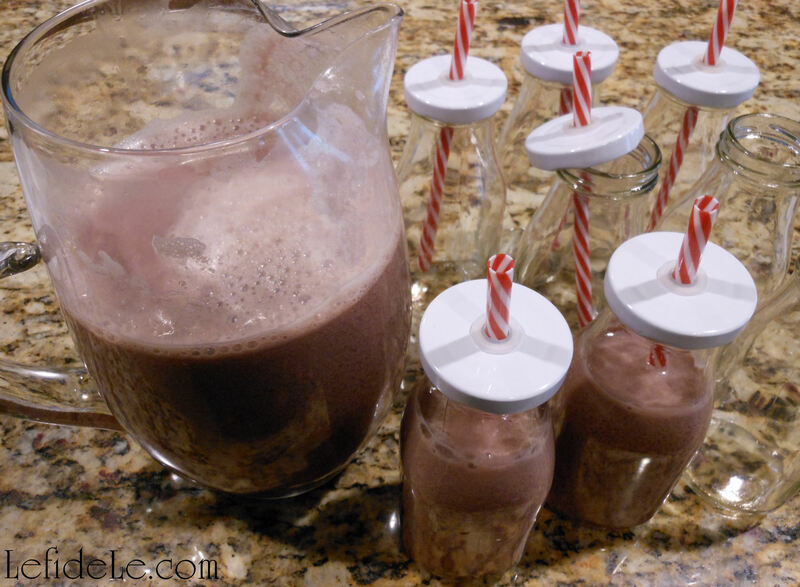 The versatile juice milk is a great way to colorize and disguise calcium while adding a flavorful kick, which is great for anyone with a picky eater. 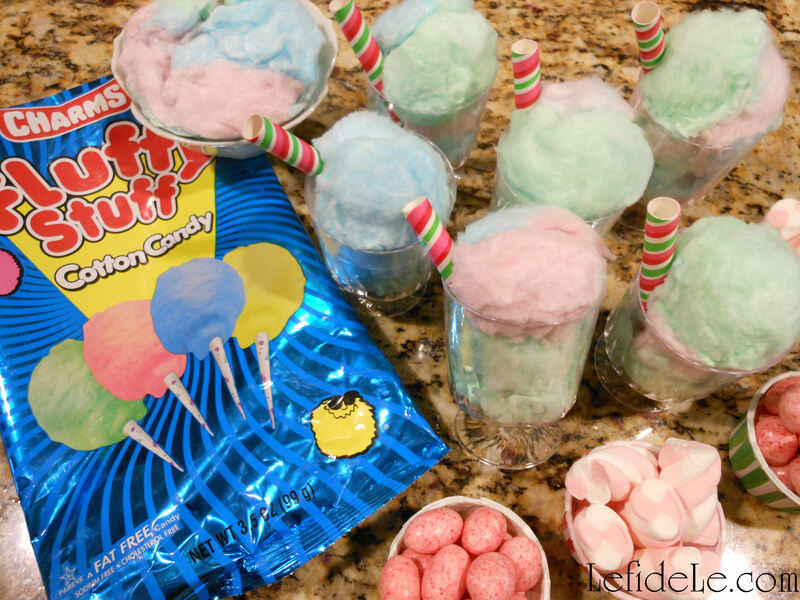 While sugary cotton candy isn’t known for its health benefits, it is a yummy once in while party-treat that looks adorable when served as ice cream sodas. 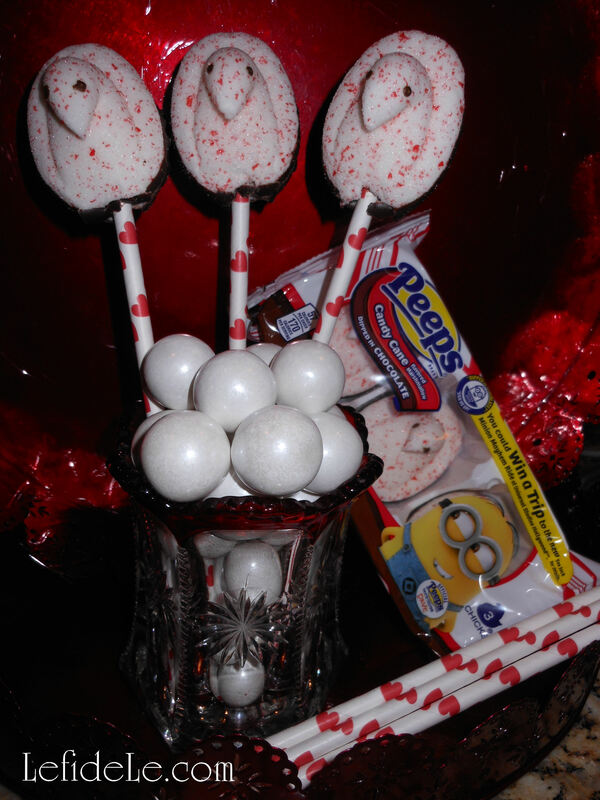 And Peep pops are the fastest pop you can prop into a candy buffet! 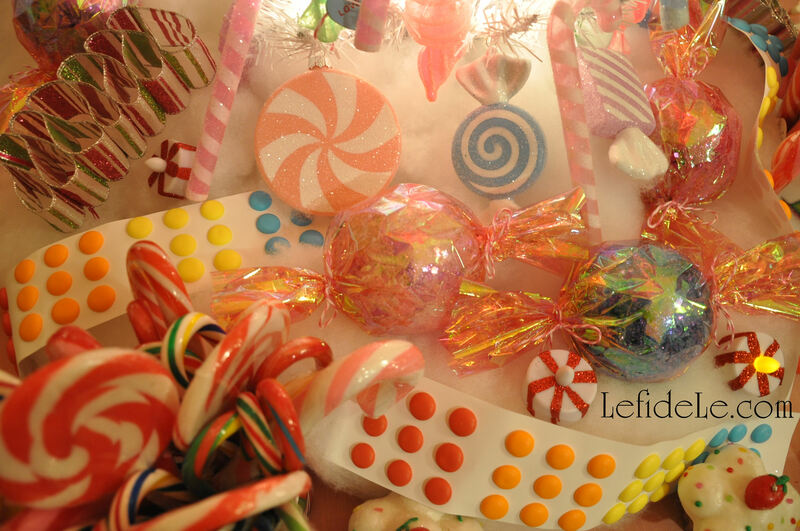 Just look for the sugar-free varieties if diabetic or avoiding corn syrup. 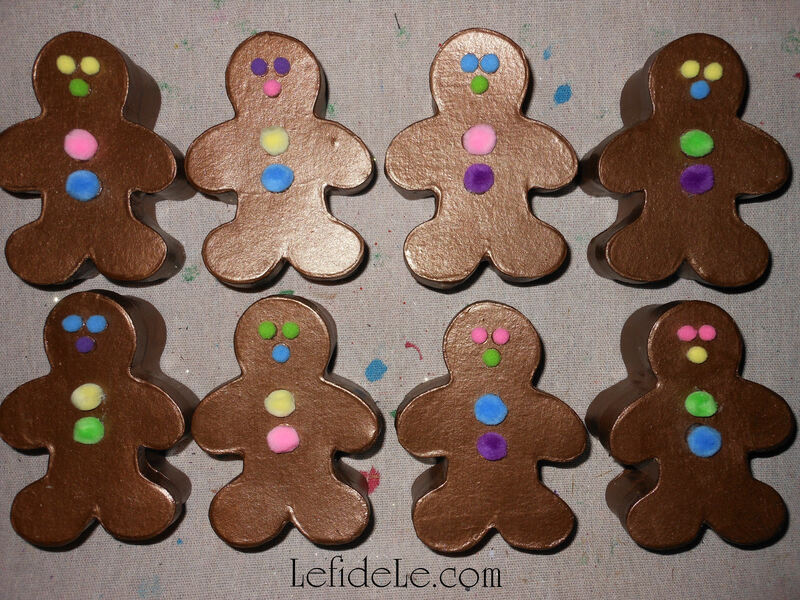 They’re still just as yummy and cute! 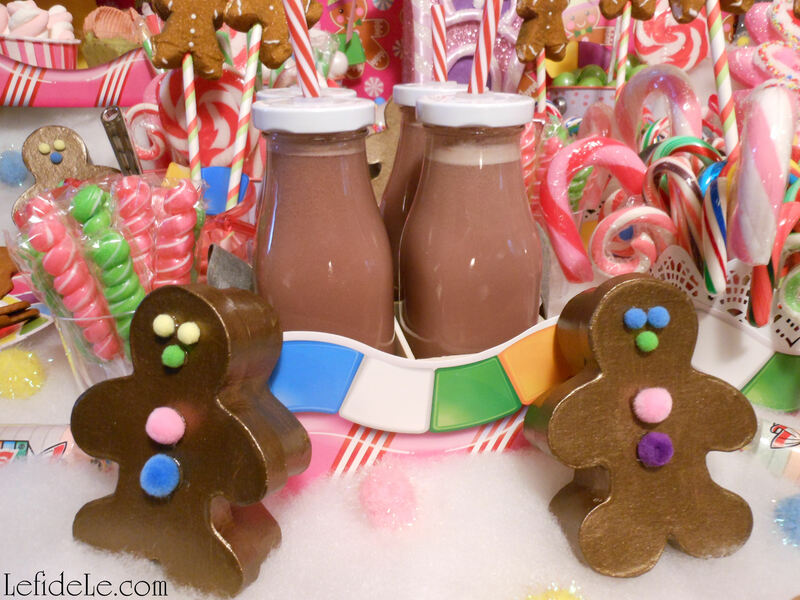 Gather any variety of pink juices and your choice of milk to test which combination you like best in a small glass. 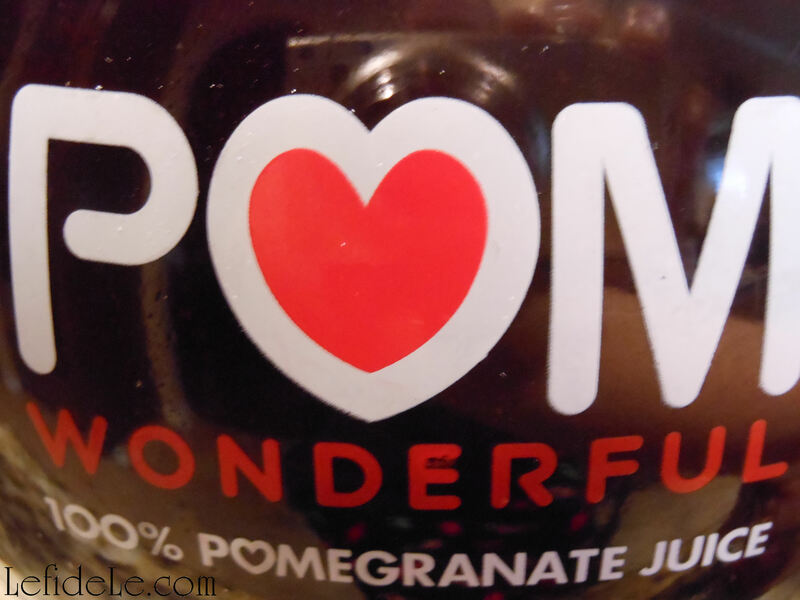 I quickly realized that I preferred the lingonberry and pomegranate juices with the original 60 calorie per cup Silk almond milk. 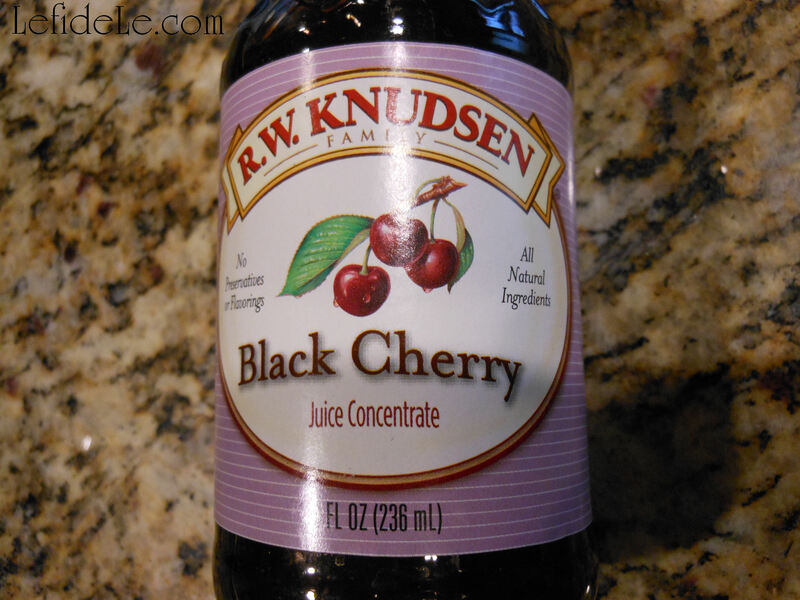 Though I typically love the black cherry concentrate, I did not care for it when combined with milk. 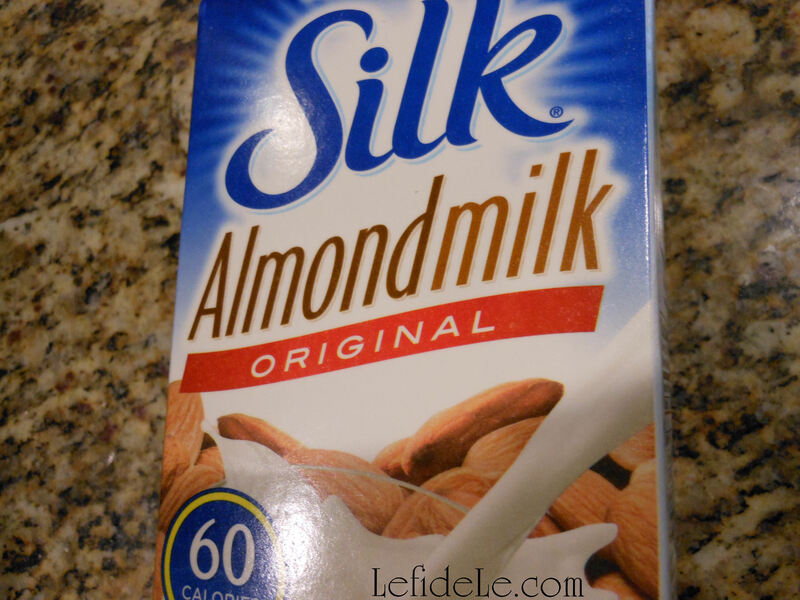 I also didn’t care for the combo with the 30 calorie Silk, but it’s a fantastic option if you’re looking to cut the numbers. 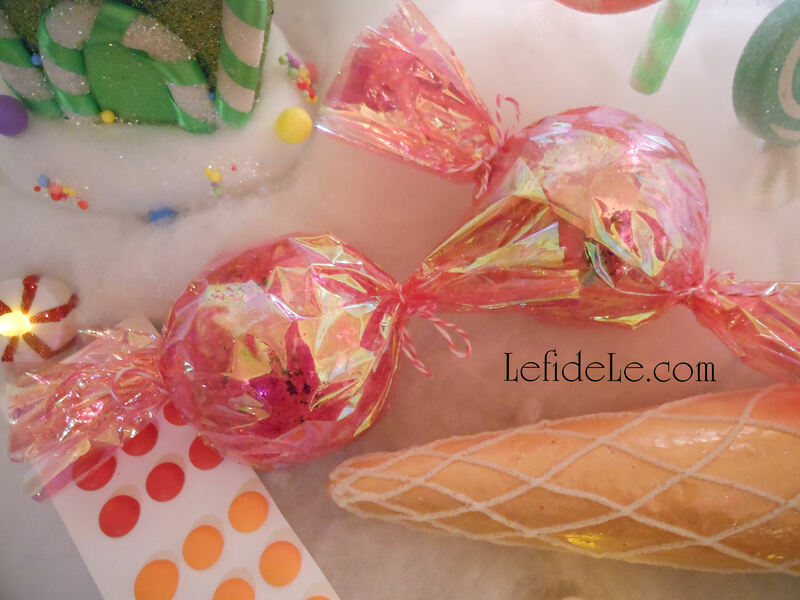 Use your own taste buds to discern your favorite, and let me know what you came up with! 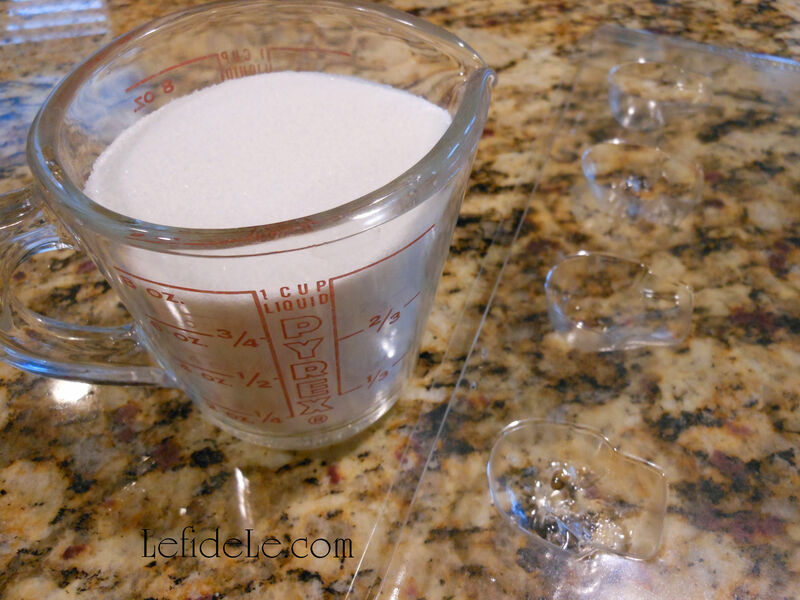 Mix a crowd sized amount in a jug, and test the flavor before pouring into individual servings. 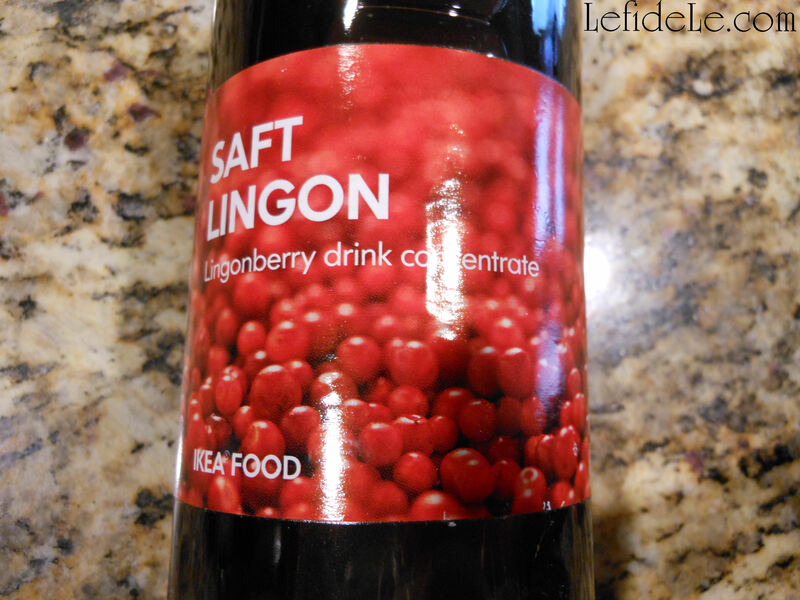 The easiest one to one ratio was the Silk’s half gallon and Ikea’s 17 ounce lingonberry concentrate, but I realize this taste profile isn’t for everyone. 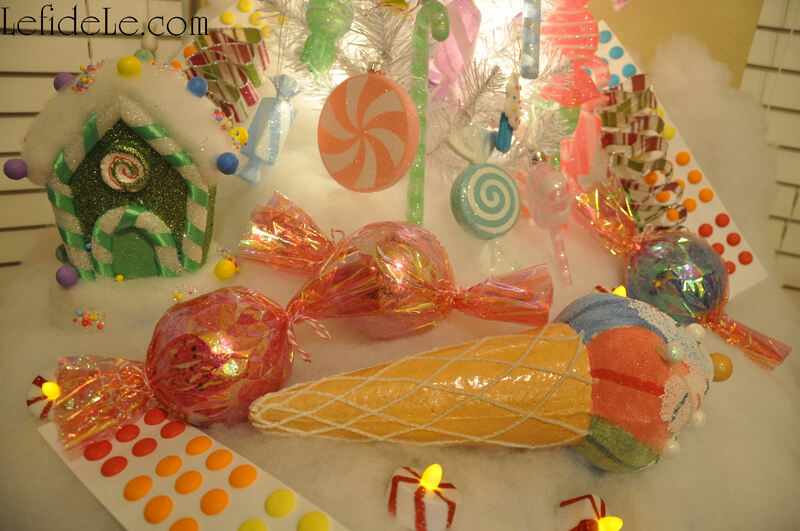 The most liked version does seem to be the orange creamscicle. 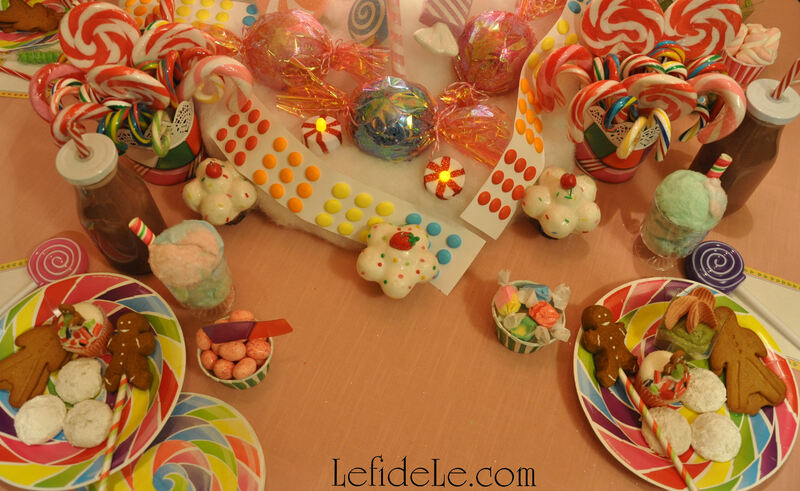 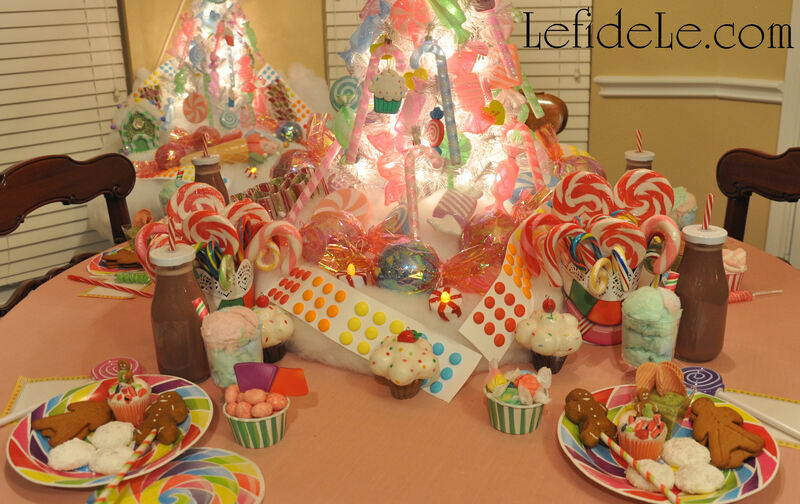 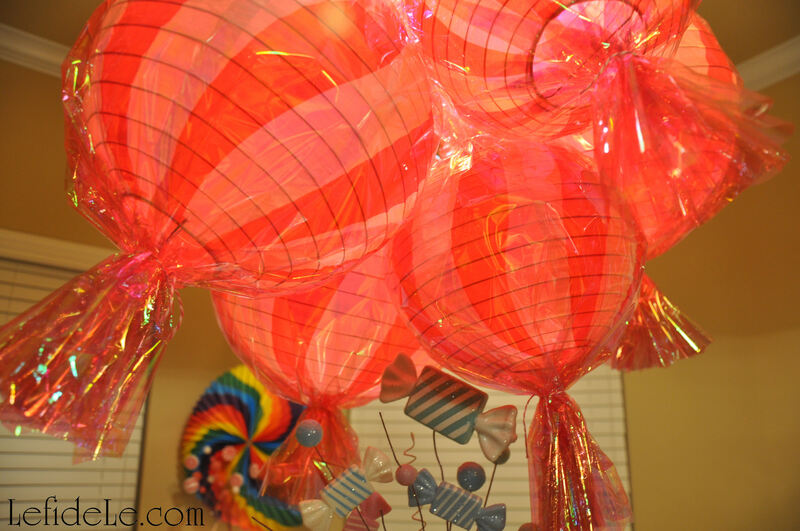 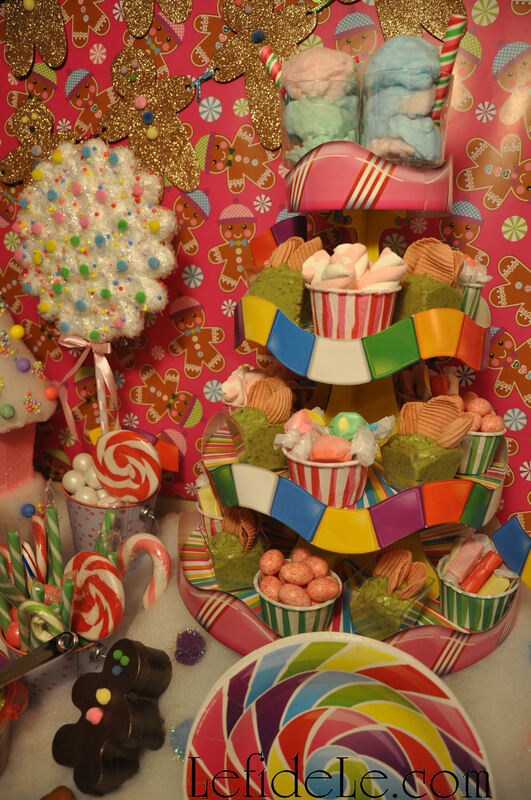 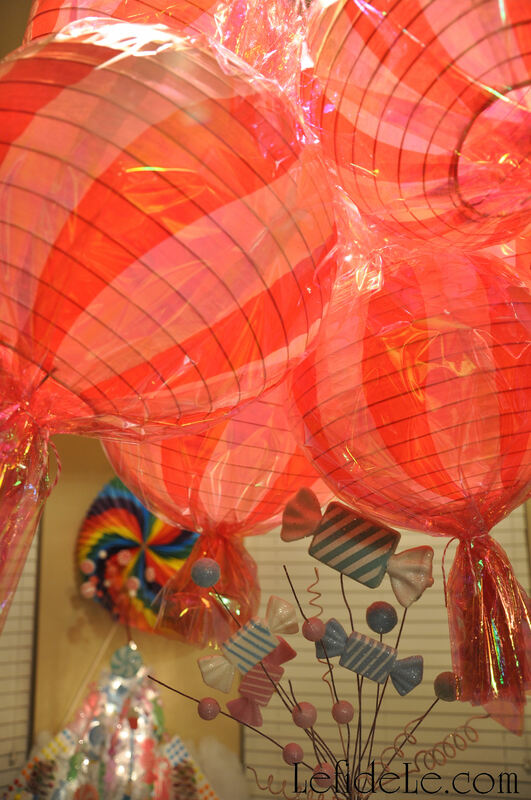 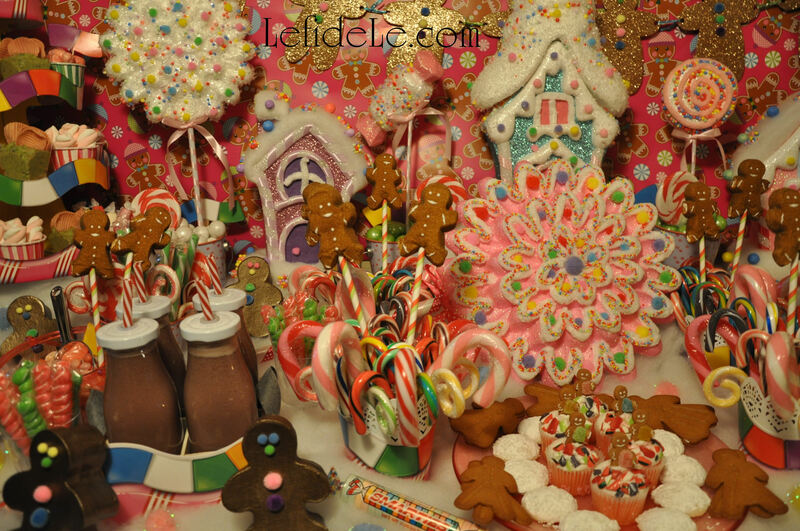 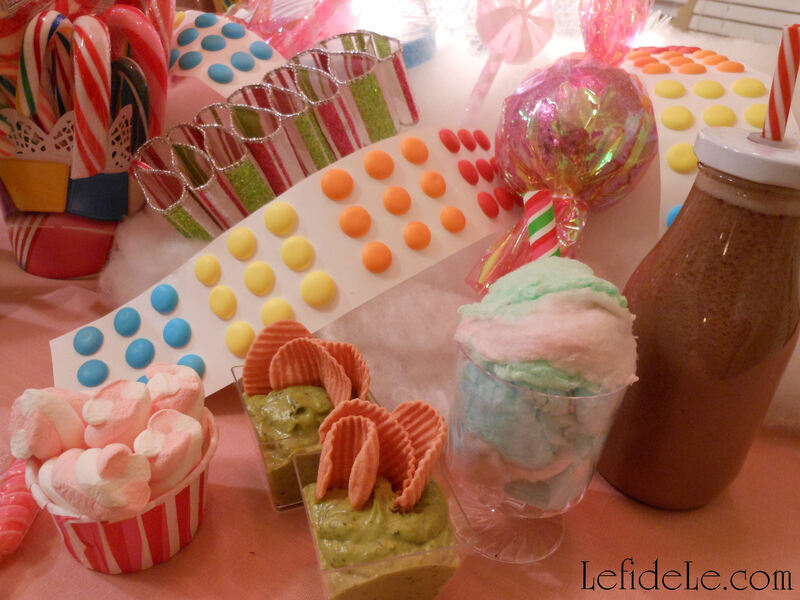 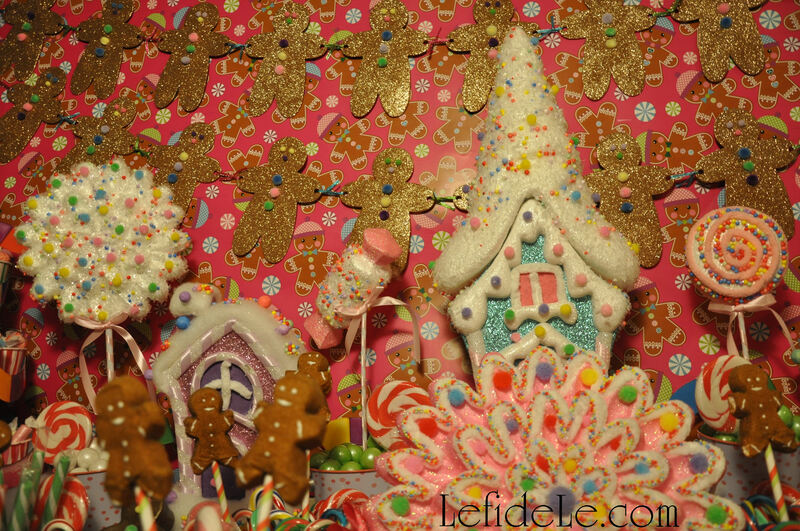 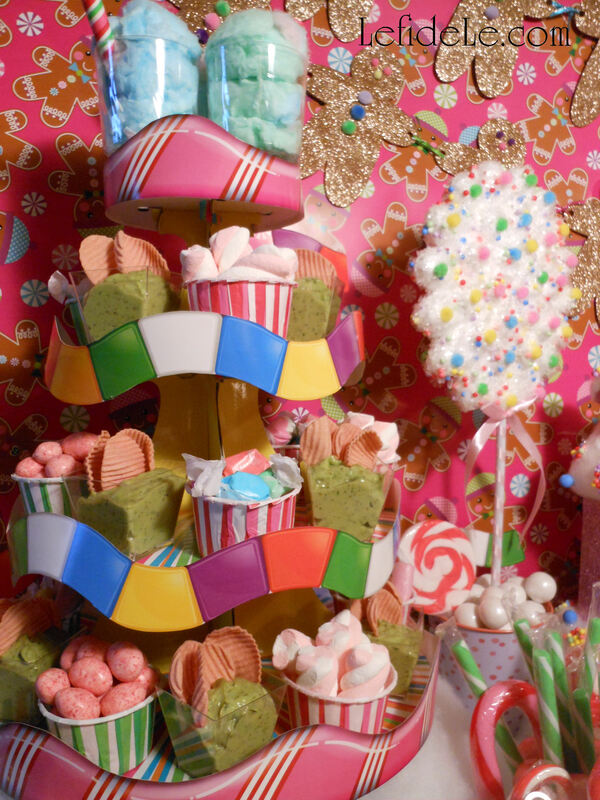 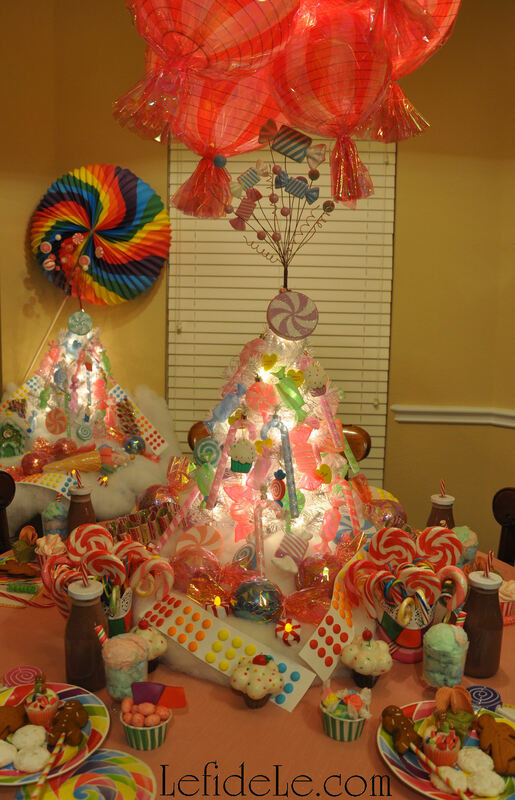 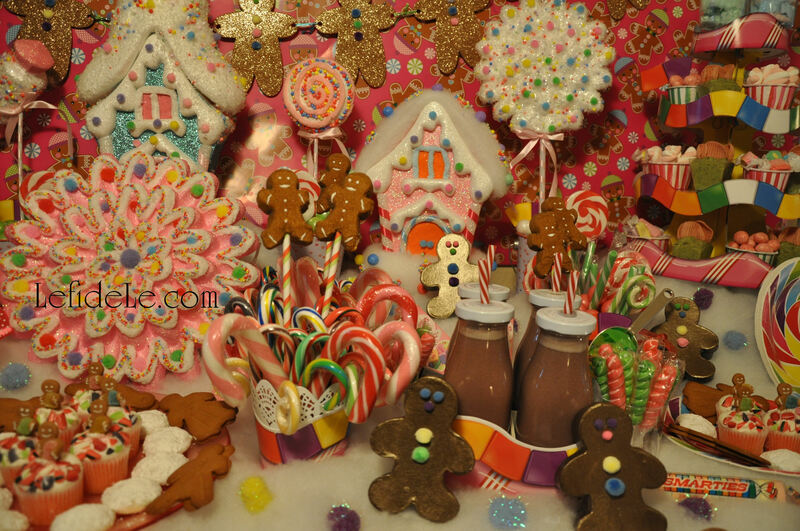 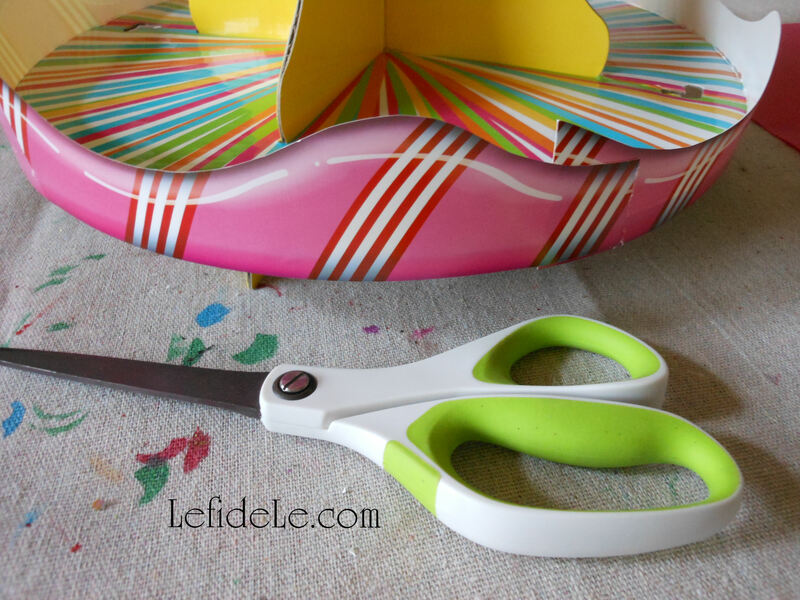 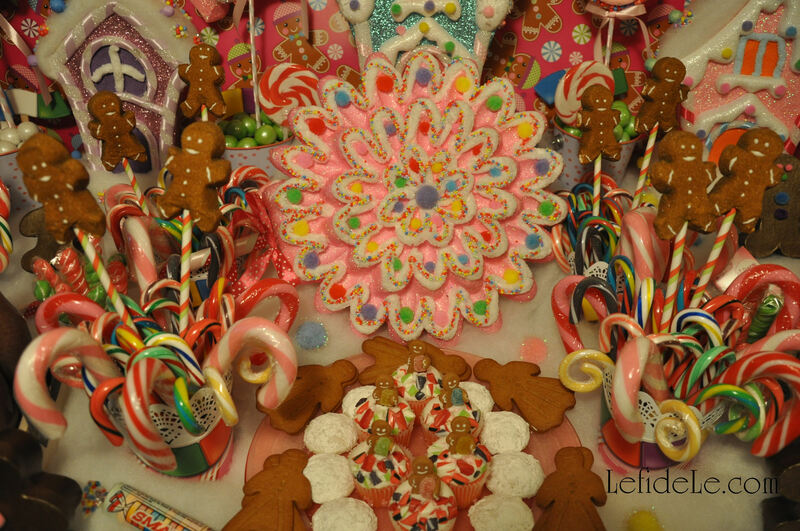 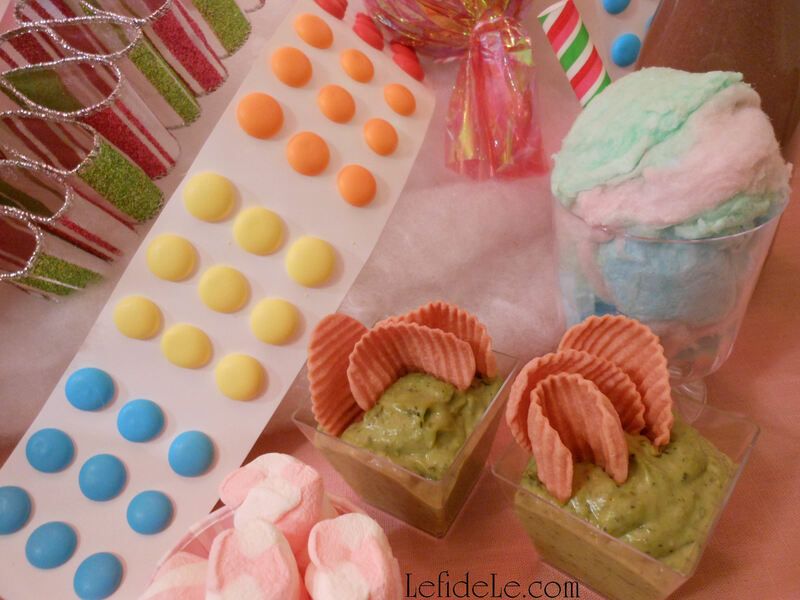 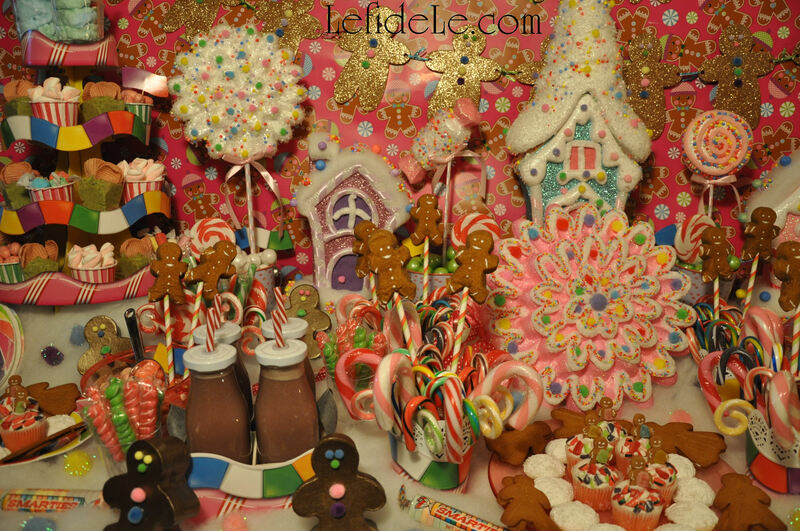 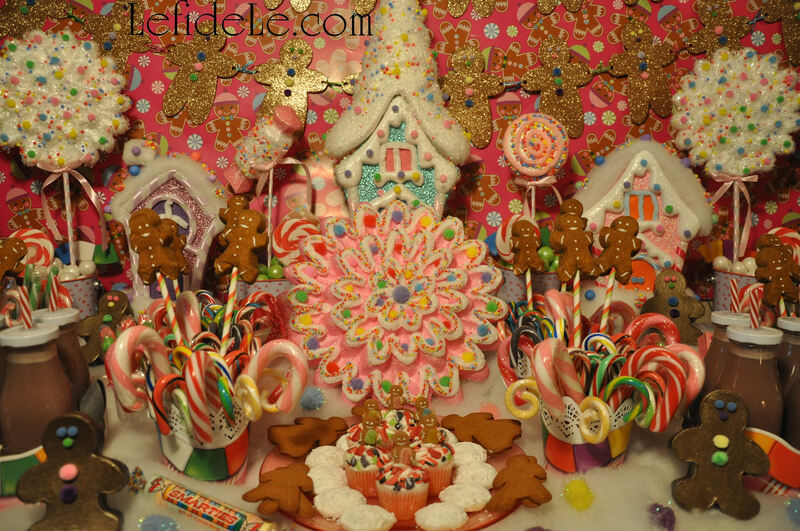 These are especially adorable when perched atop a treat tower, like this one I crafted for the Candyland theme. 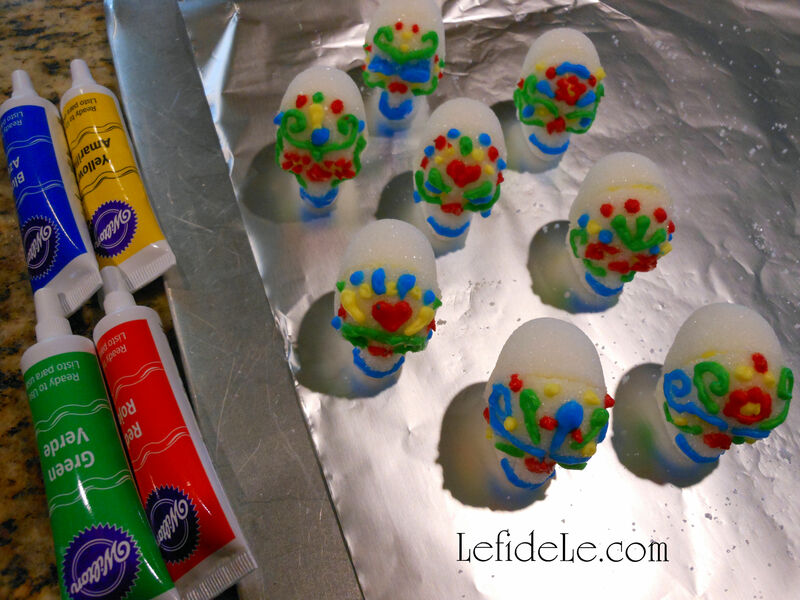 It literally takes 2 seconds to make a Peep Pop, so it’s a last minute treat that looks absolutely precious. 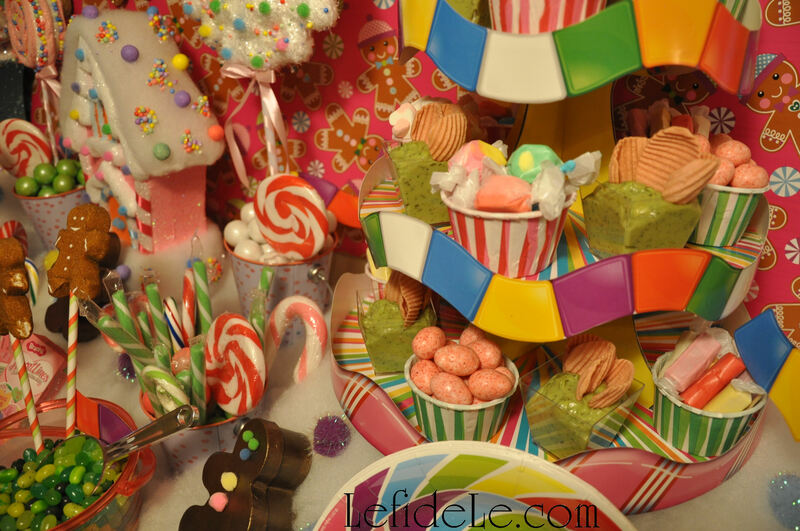 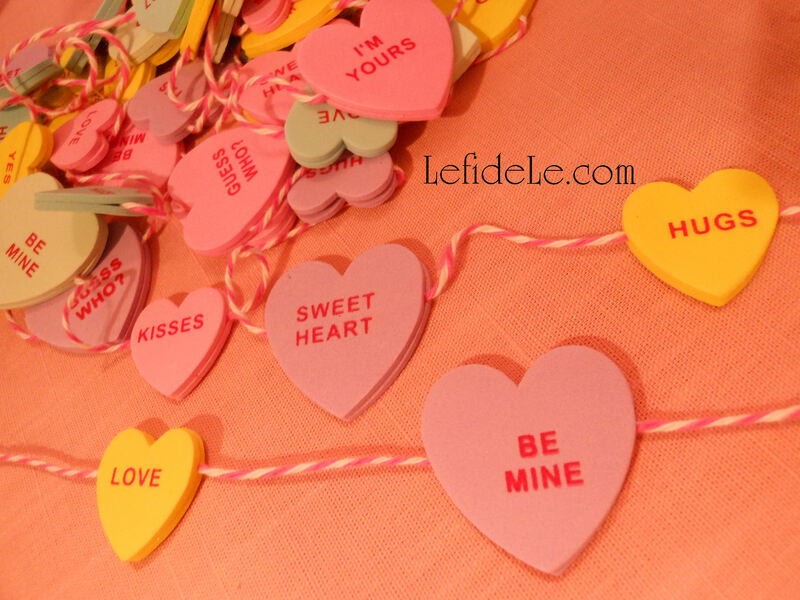 You can find so many varieties of the darling confections just about anywhere (and online year round), so it’s easy to add them to any candy buffet. 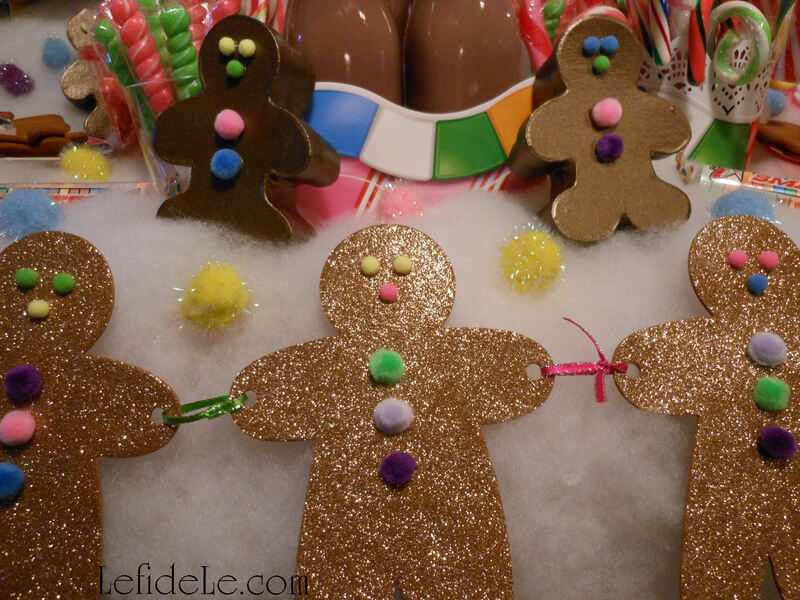 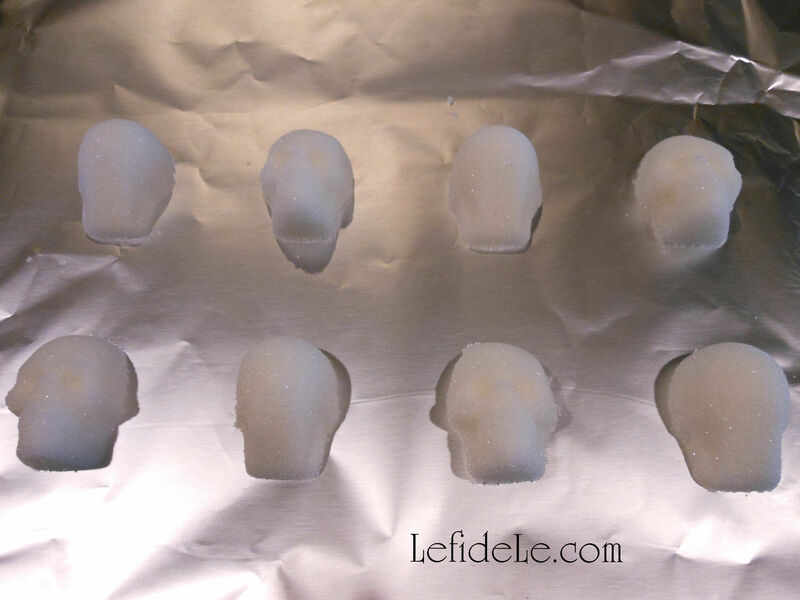 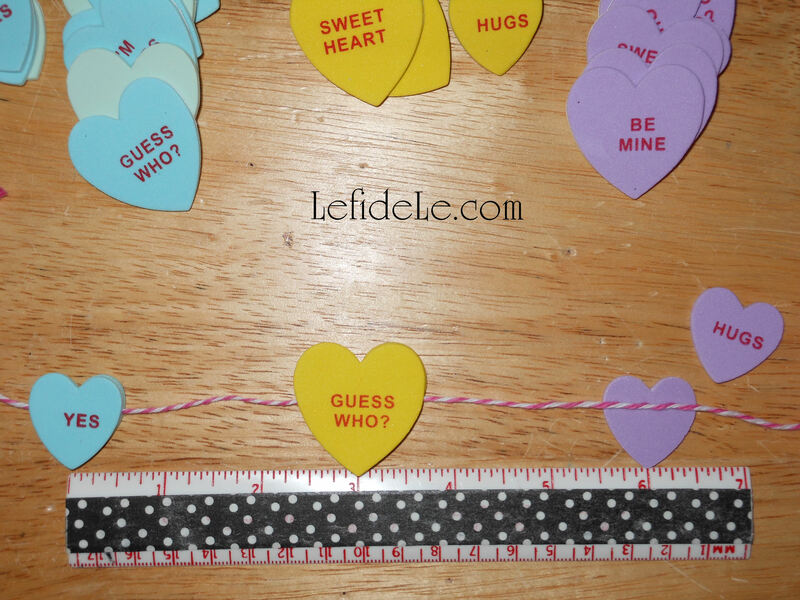 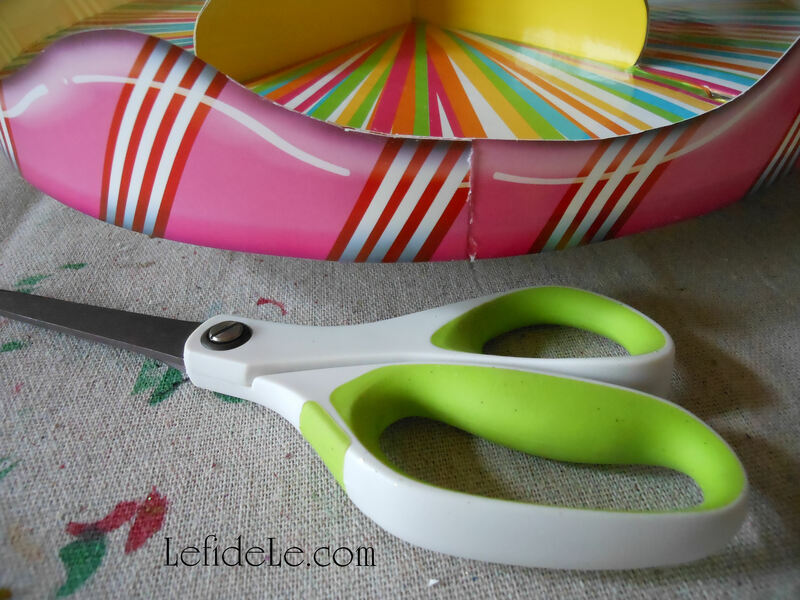 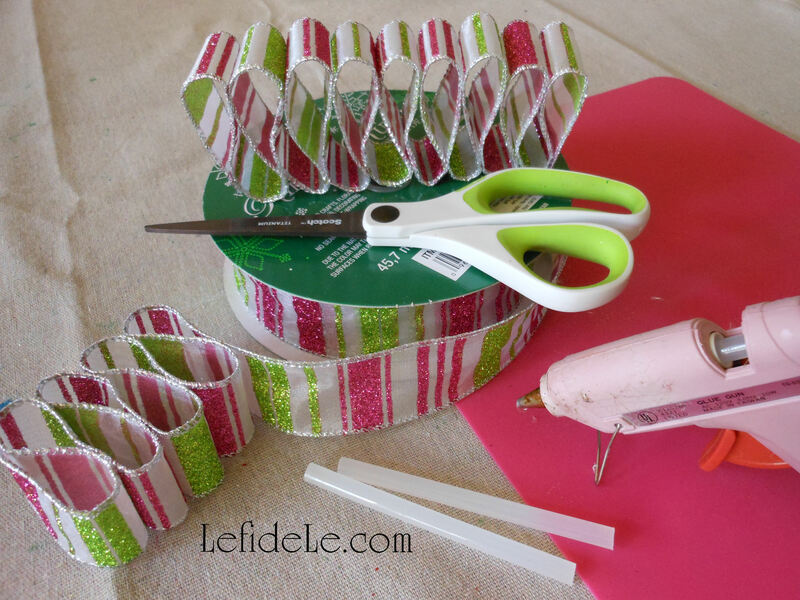 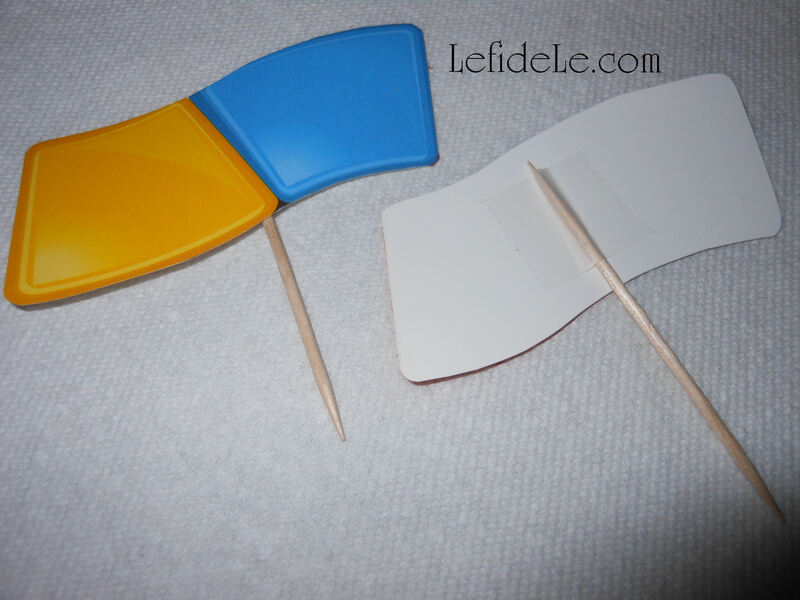 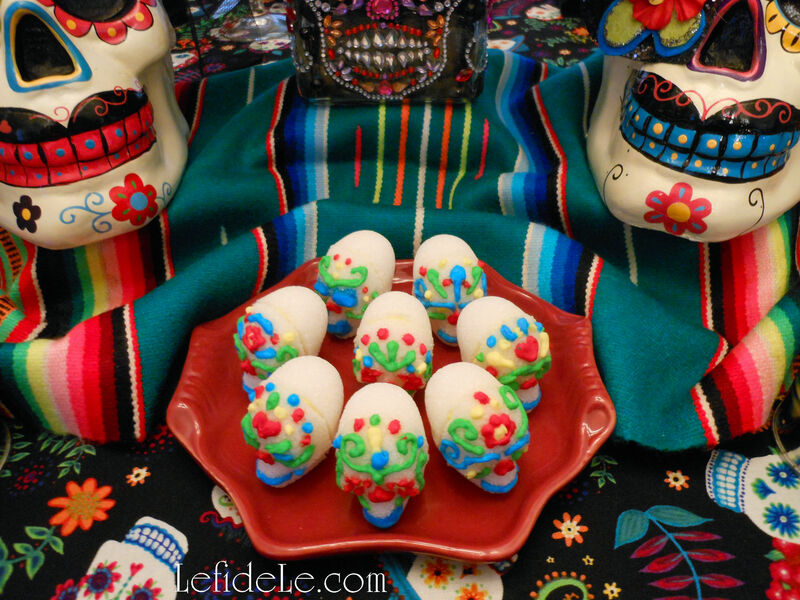 Simply poke a hole in each peep base with a skewer or toothpick, and wiggle it side to side to widen that hole. 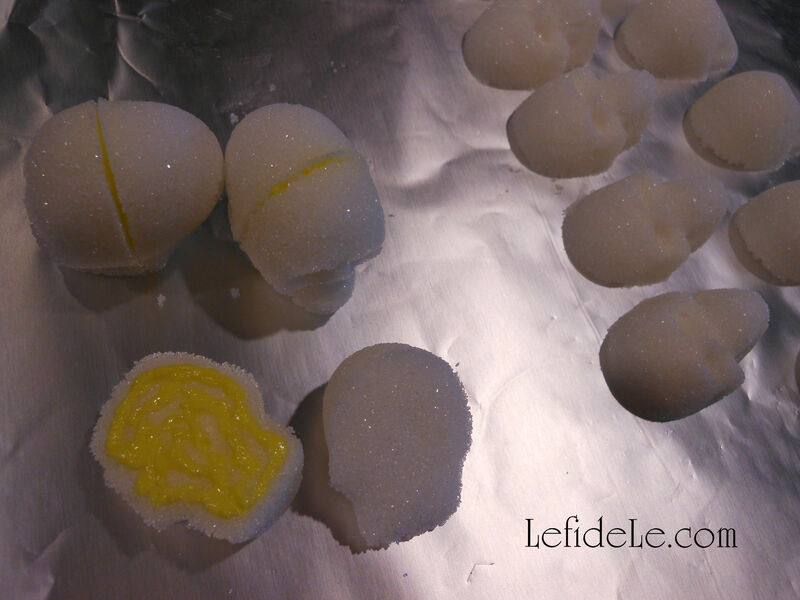 Slowly push in a straw until it feels securely held, yet doesn’t disfigure the peep. 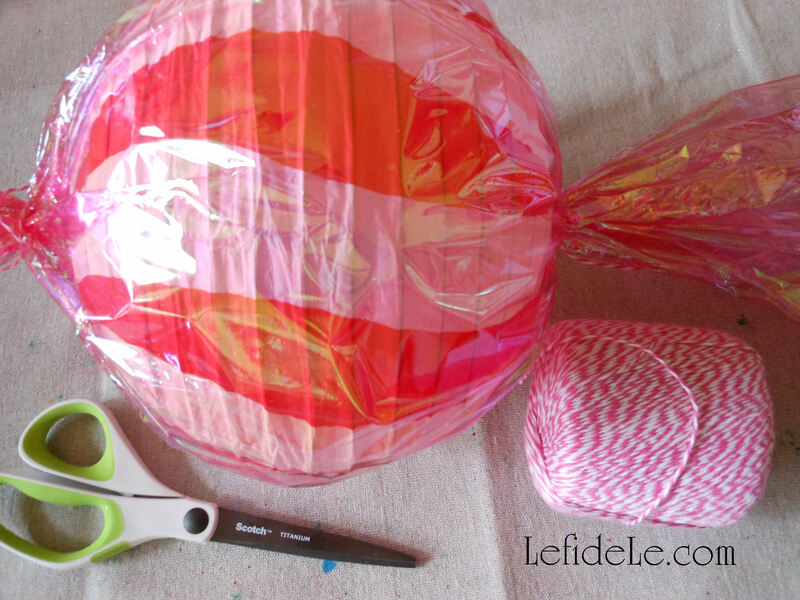 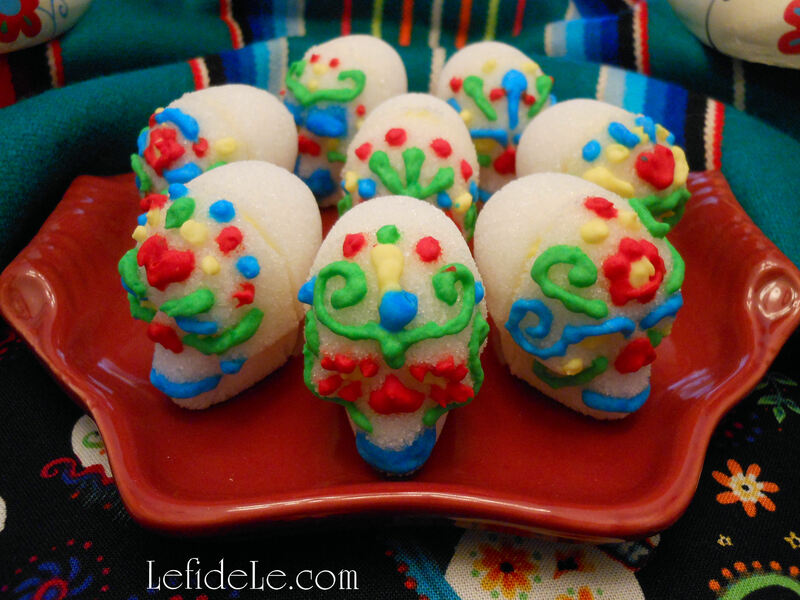 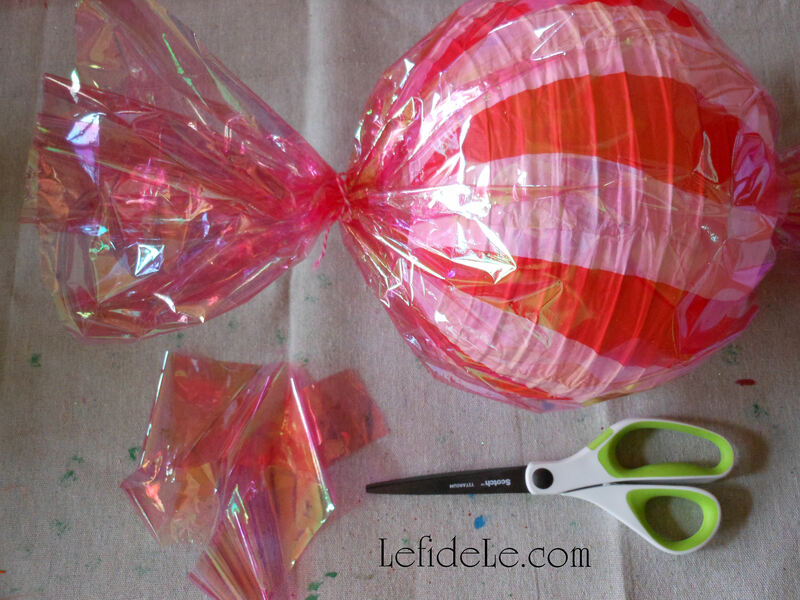 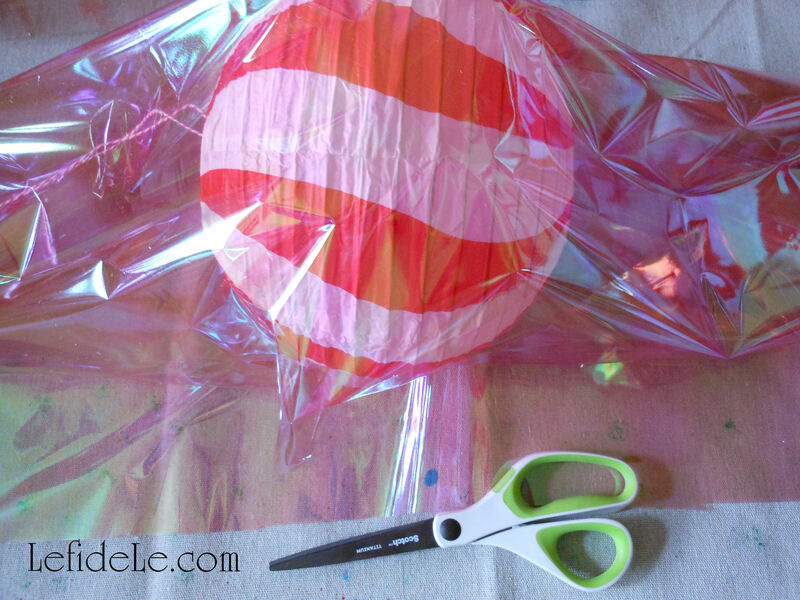 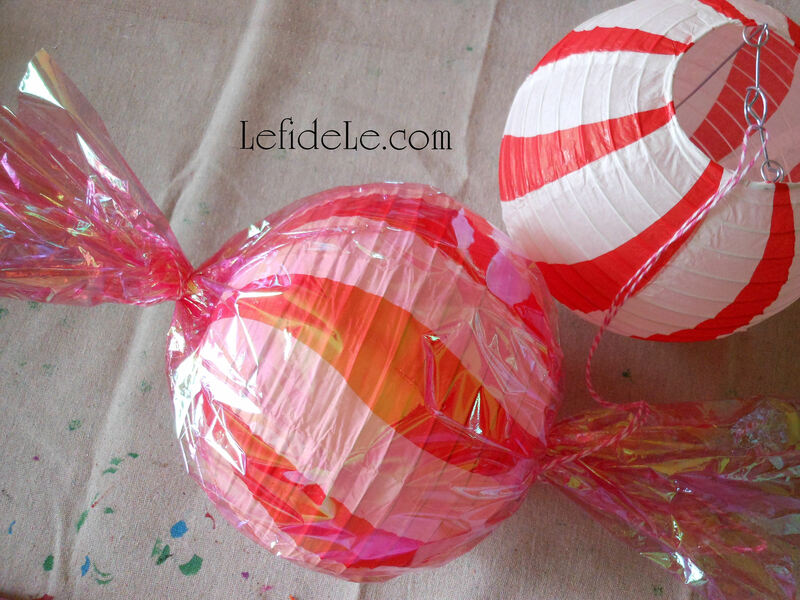 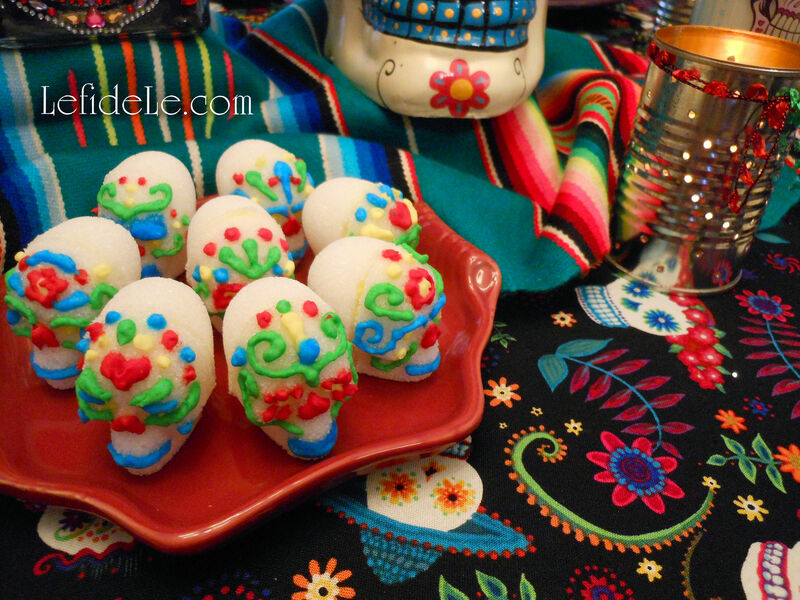 Prop it into a cake pop holder or vessel filled with non-sticky candy like gumballs or jellybeans. 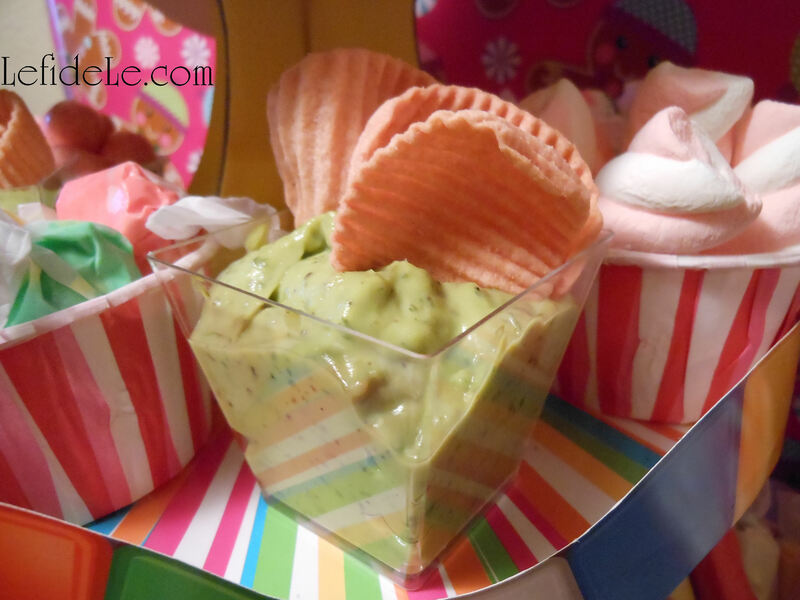 For a tasty yet healthy snack to add to your Candyland theme, try my Spicy Guacamole Shooters / Avocado Appetizers Recipe (Allergy-Friendly & Nightshade Free = No Red Pepper or Tomatoes). 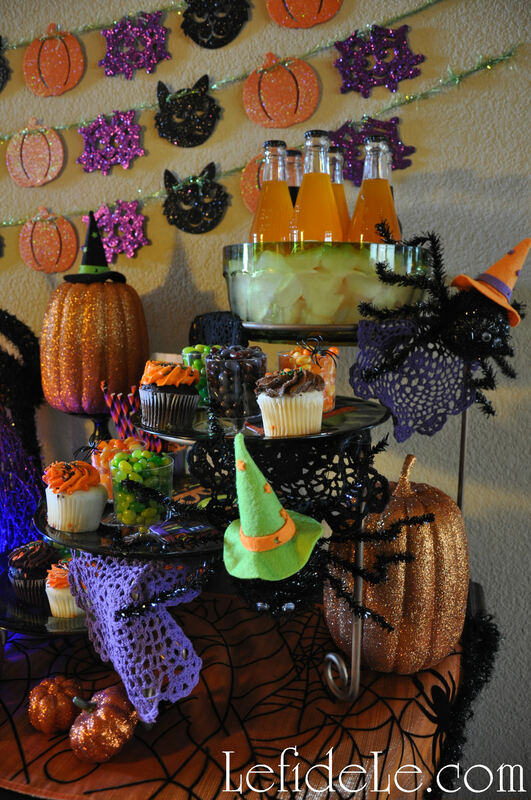 This year’s Halloween party theme was “Glitter-Ween”! 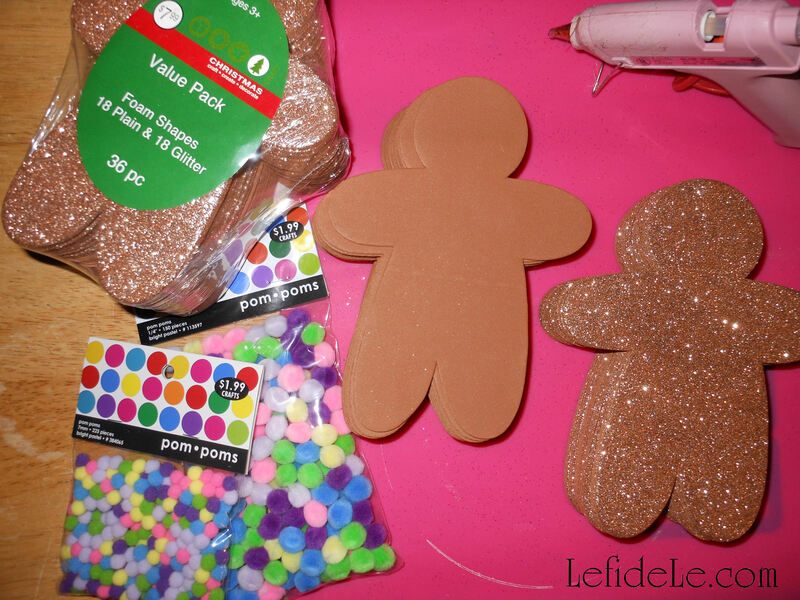 This gave me a plausible excuse to paint, spray, or glue… orange, purple, green, and black glitter to my heart’s content… at least until February that is. 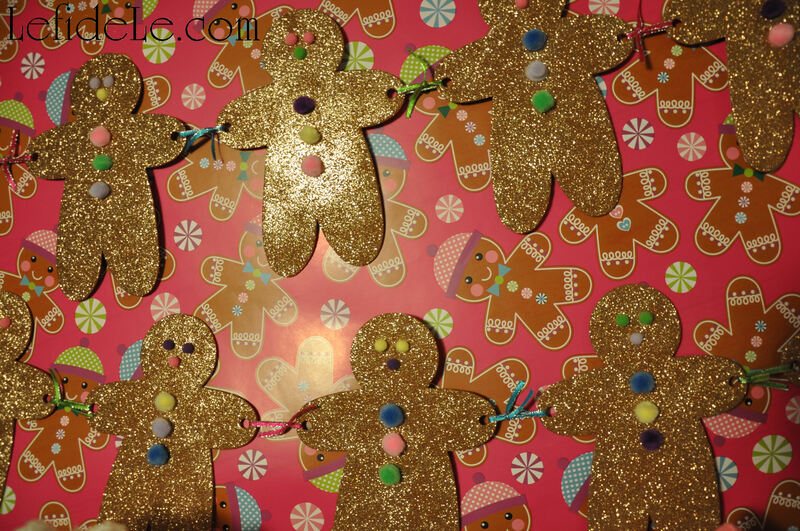 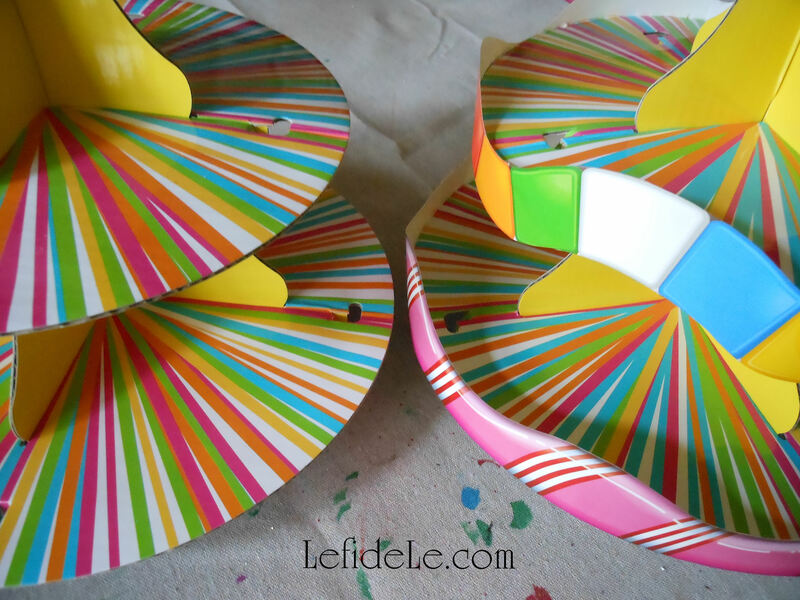 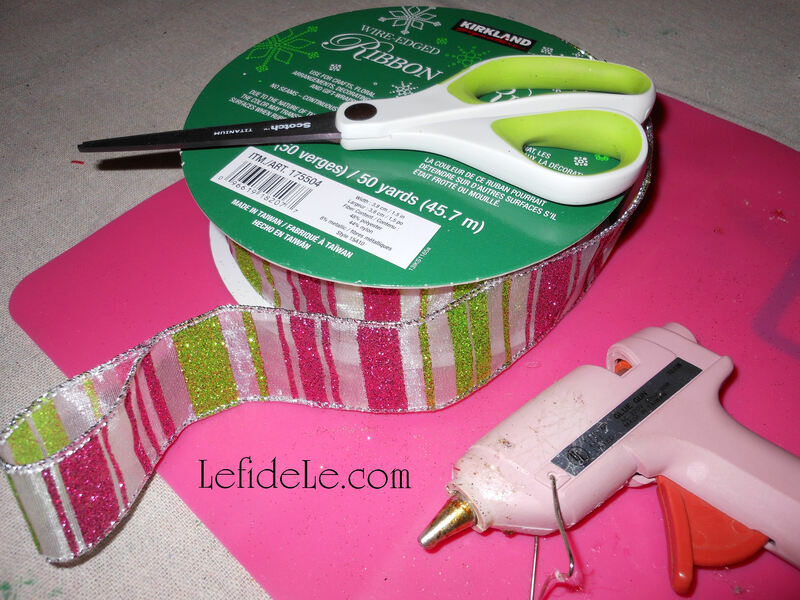 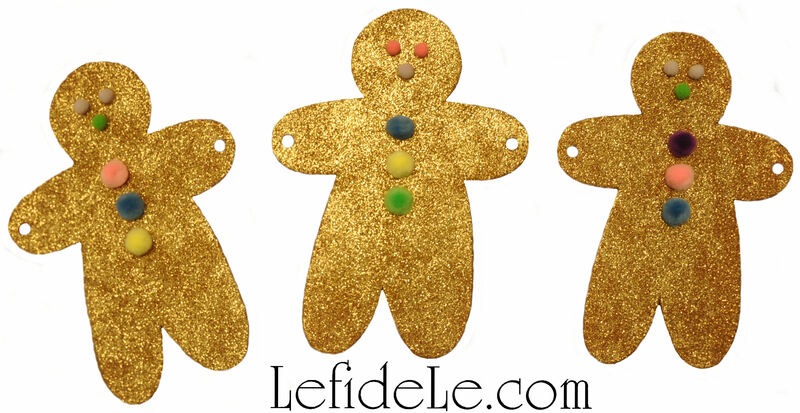 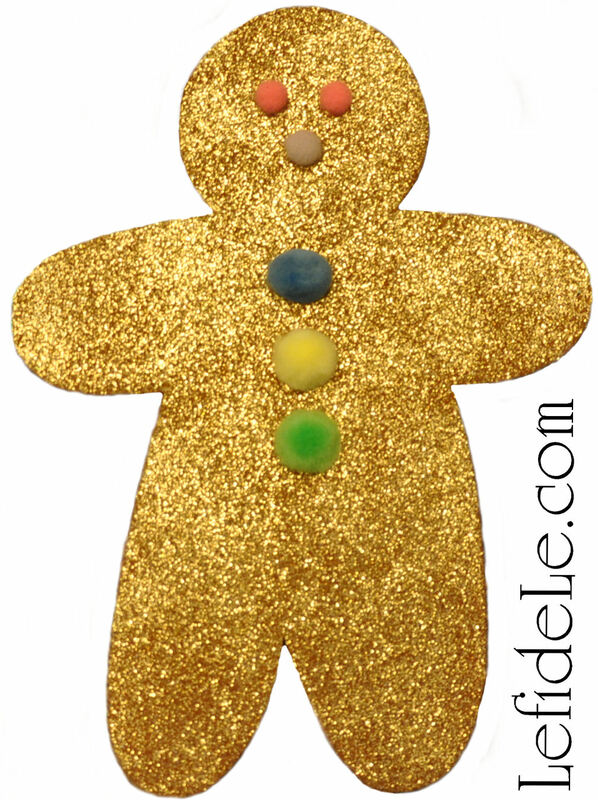 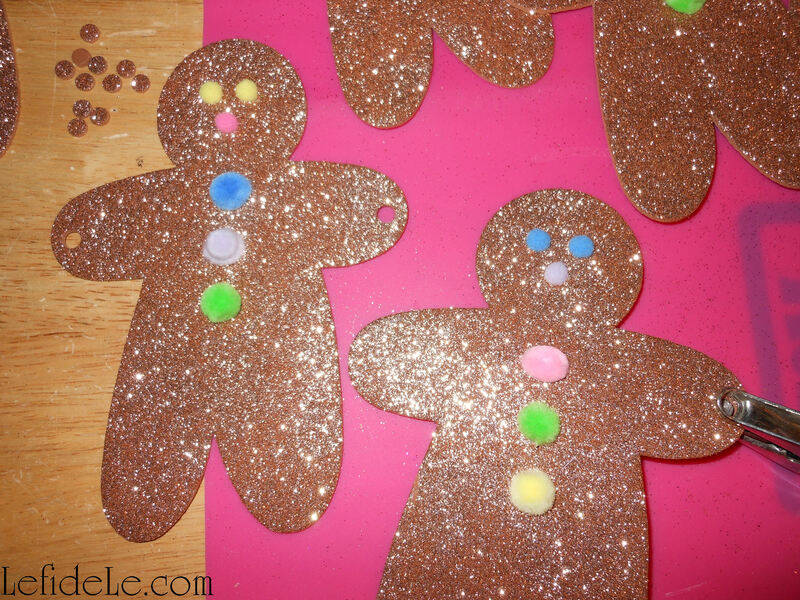 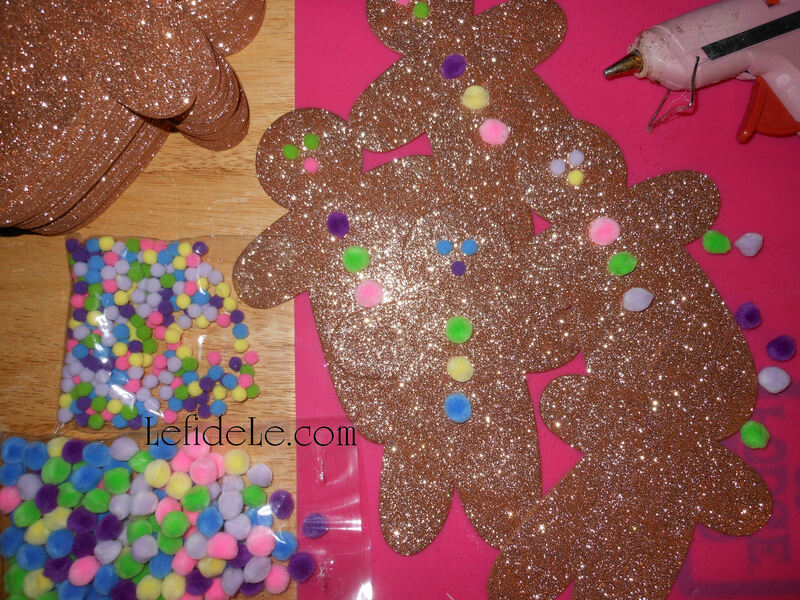 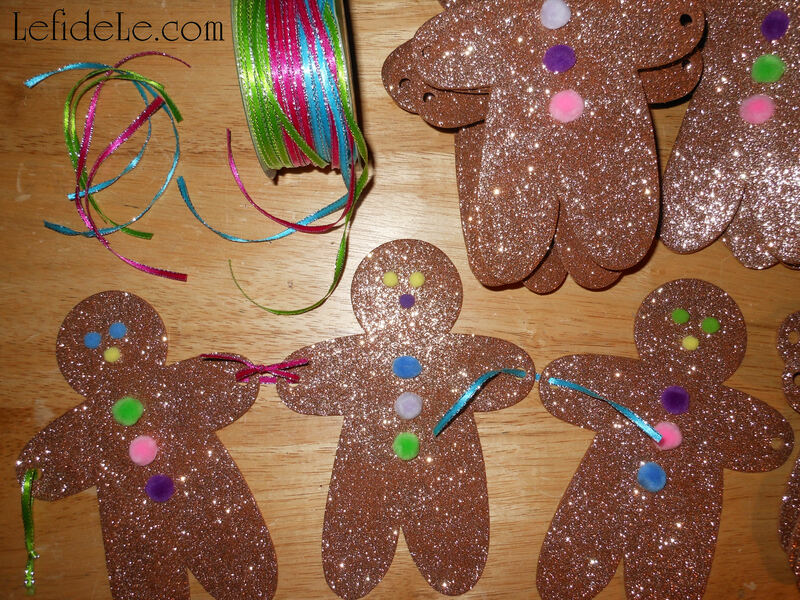 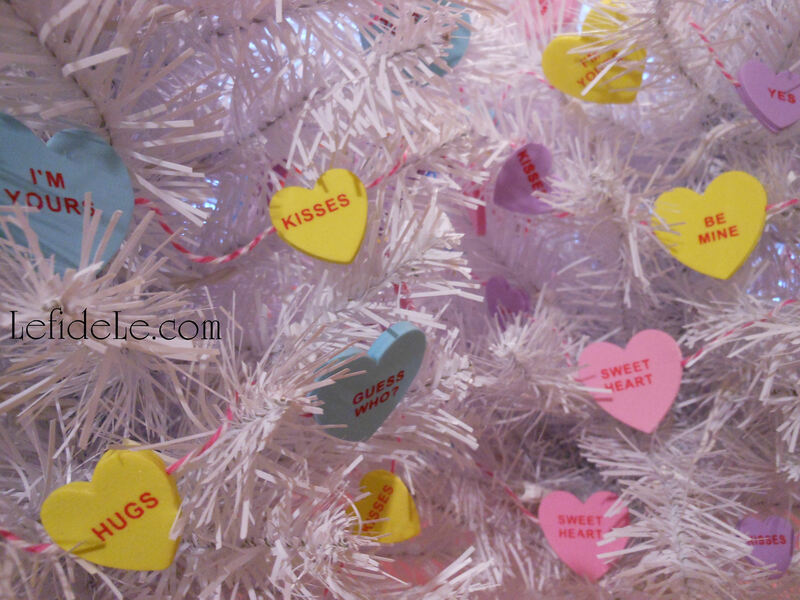 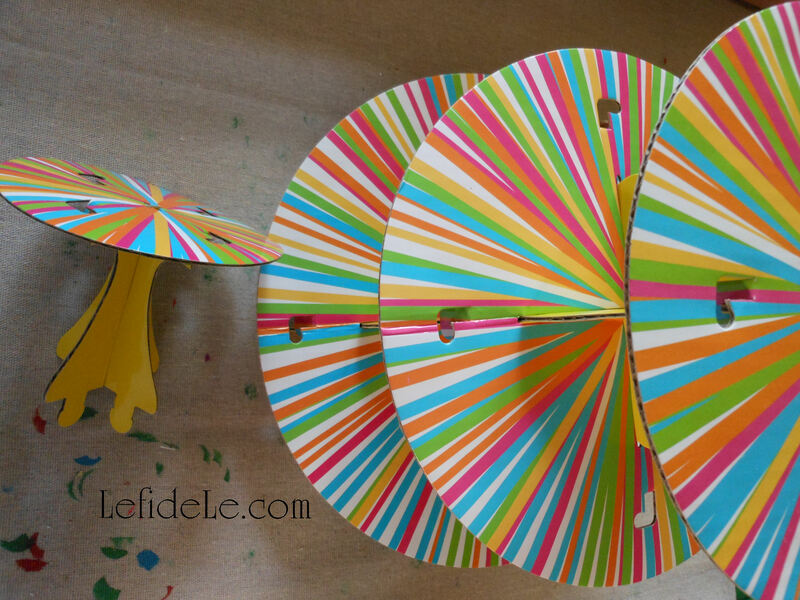 Here are some decorating ideas from my glitter-splosion event! 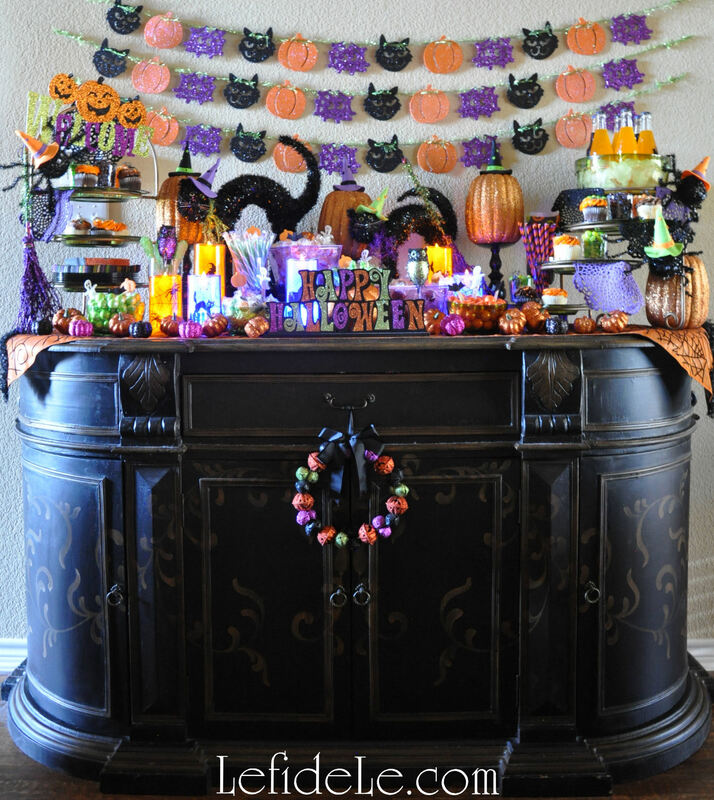 The black painted console was the perfect stage for the “candy-bar” buffet. 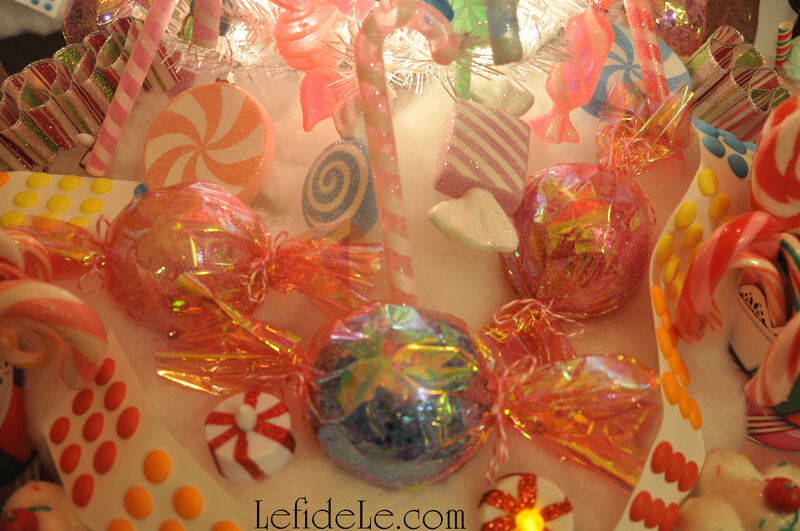 One small glittered bell wreath kept it from appearing too top heavy. 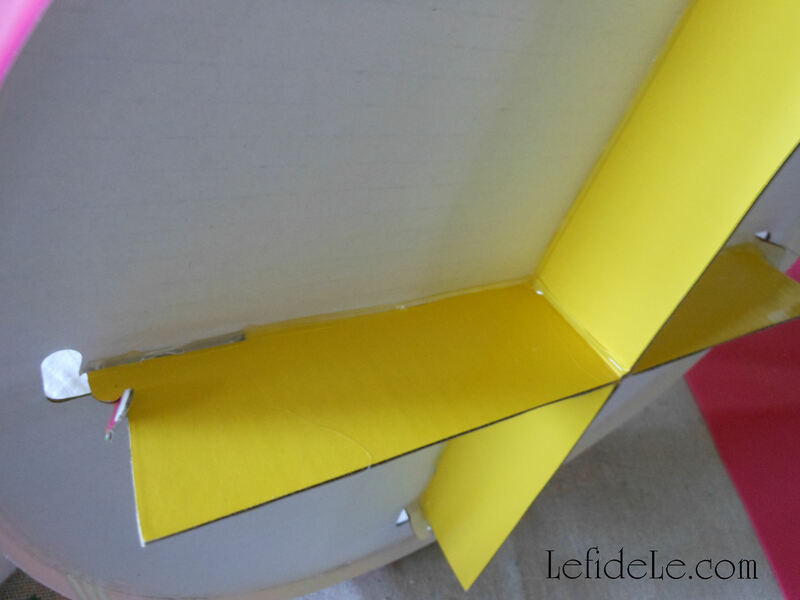 An orange spider-web runner lined and protected the painted top. 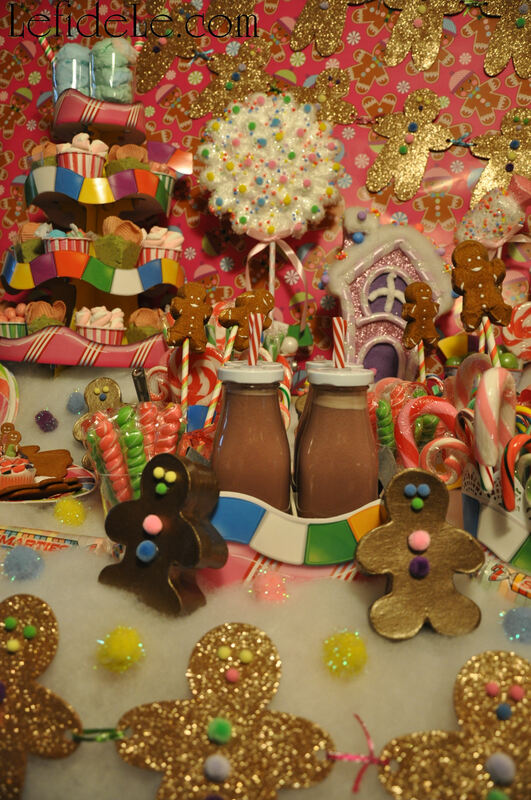 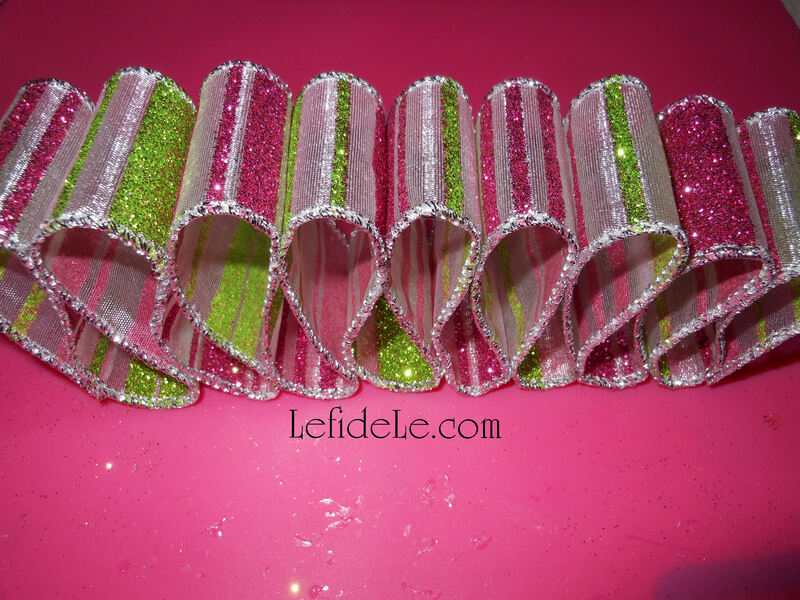 My glitter garland remade craft filled in the background of the smorgasbord. 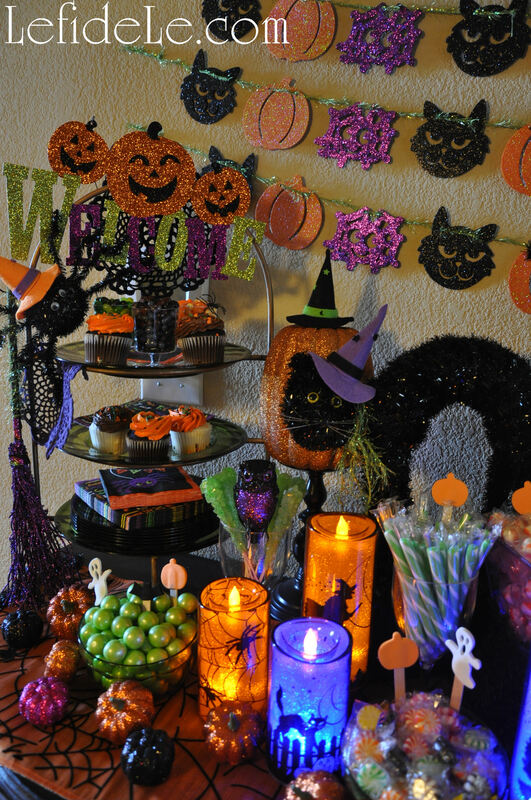 Candlesticks held glittered pumpkins at visible heights behind witch-cats who guarded the sweets. 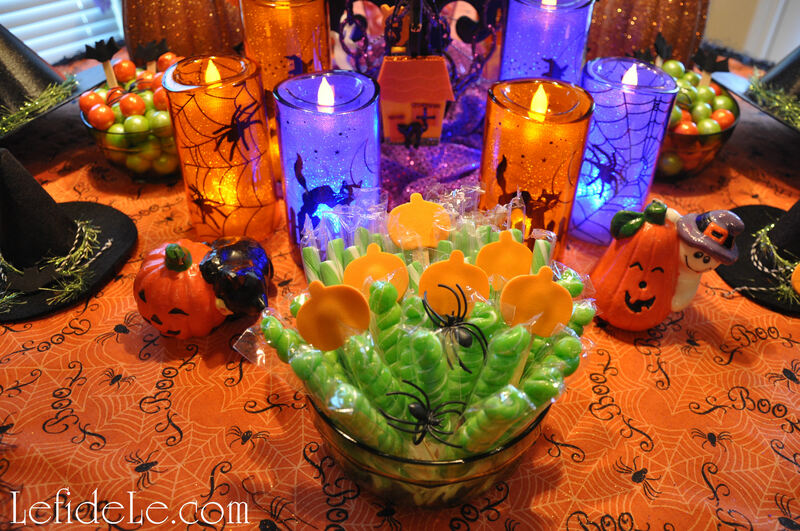 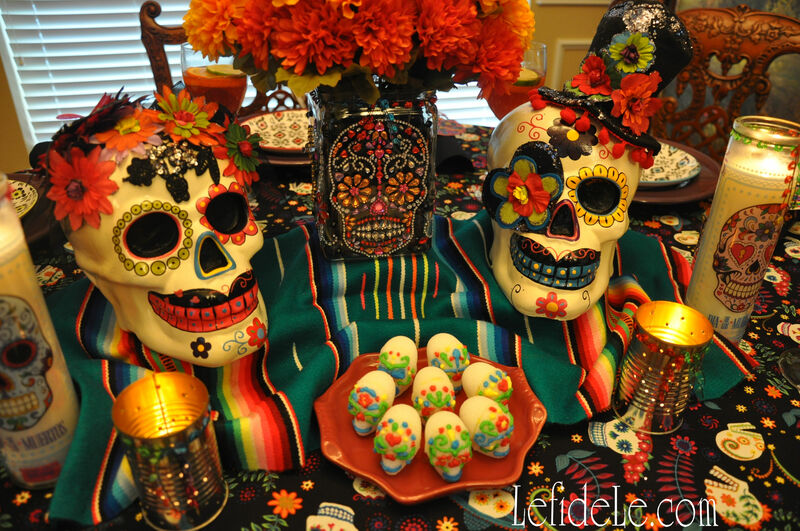 Theme colored candy filled bowls were accented with pumpkins, ghosts, and bats from my foam puppet / food pick craft. 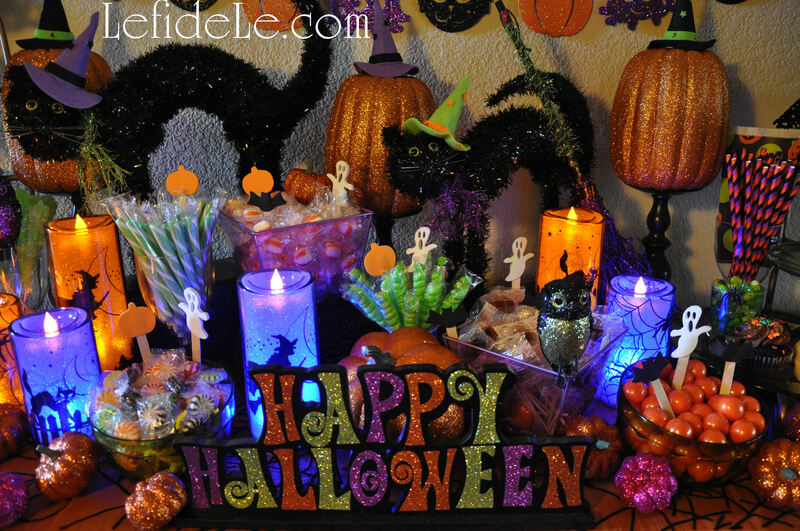 LED candles eerily lit the scene safely, where no normal candle would have dared been set. 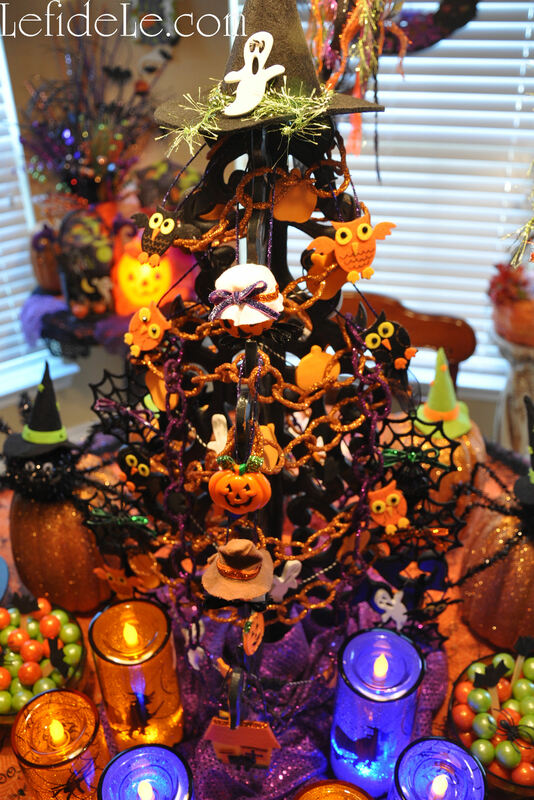 Spiders climbed the treat tower hung with their “spider-web” doilies. 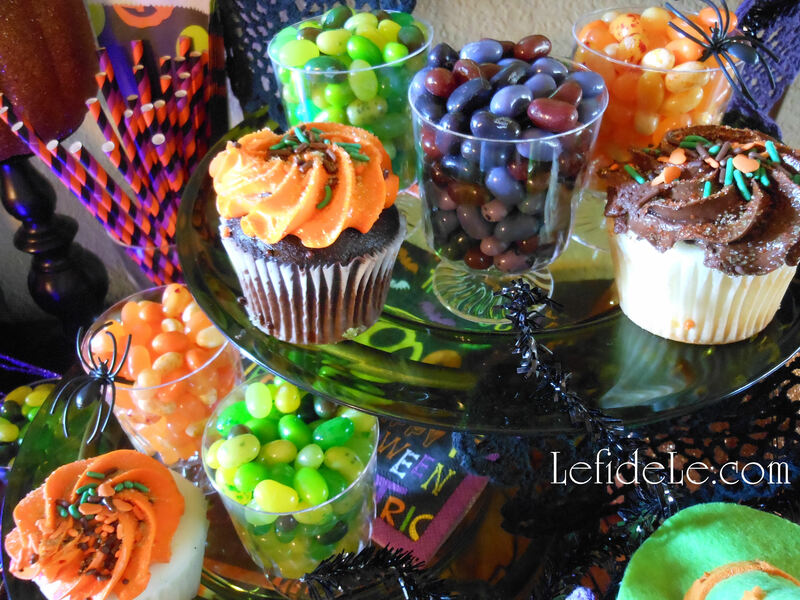 Monochromatic jelly bean cups sat next to a variety of cupcakes on various lifts and levels. 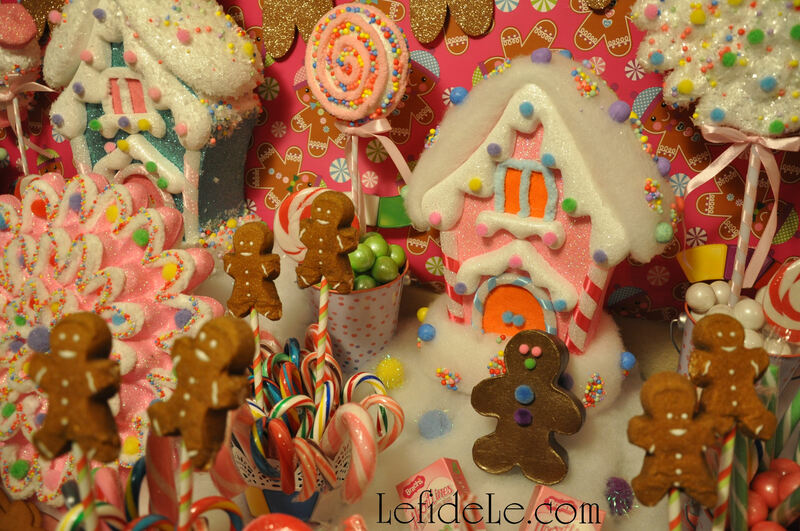 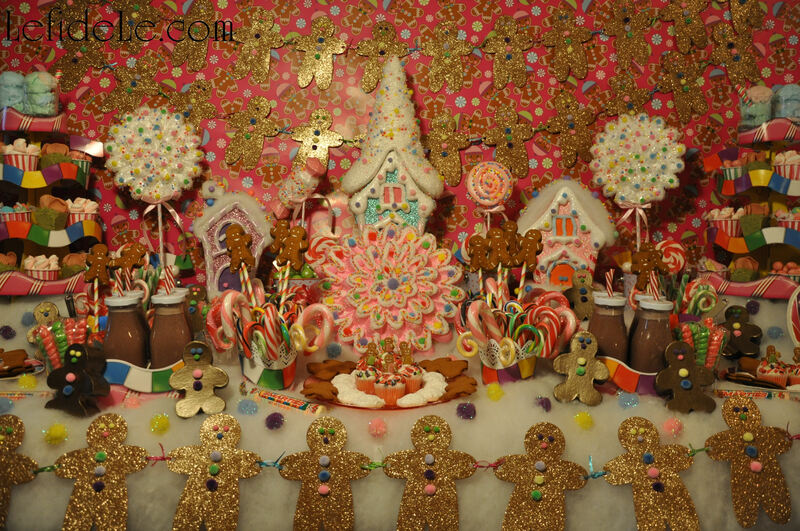 Glittered brooms camouflaged another treat tower’s sides while a shimmering welcome beckoned at the top. 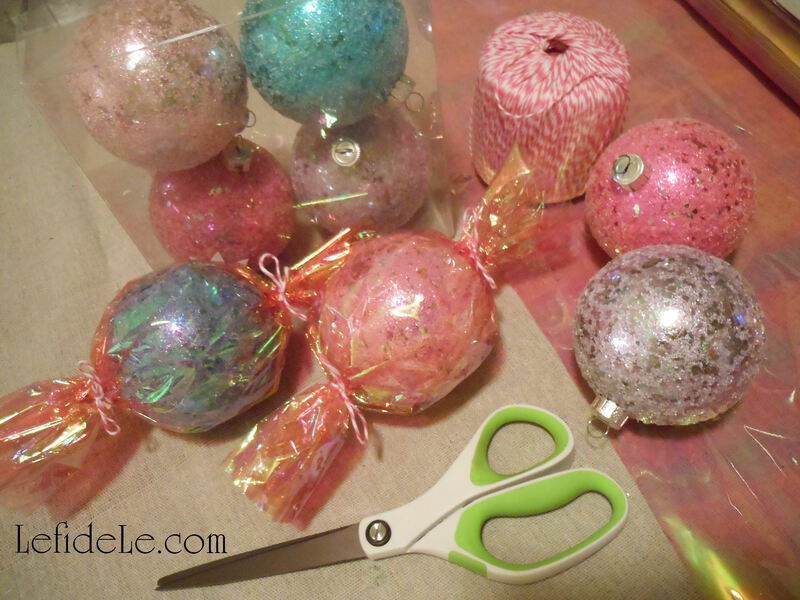 In the breakfast room, a wooden tree painted black, was trimmed with my garlands craft and my ornaments from scraps craft. 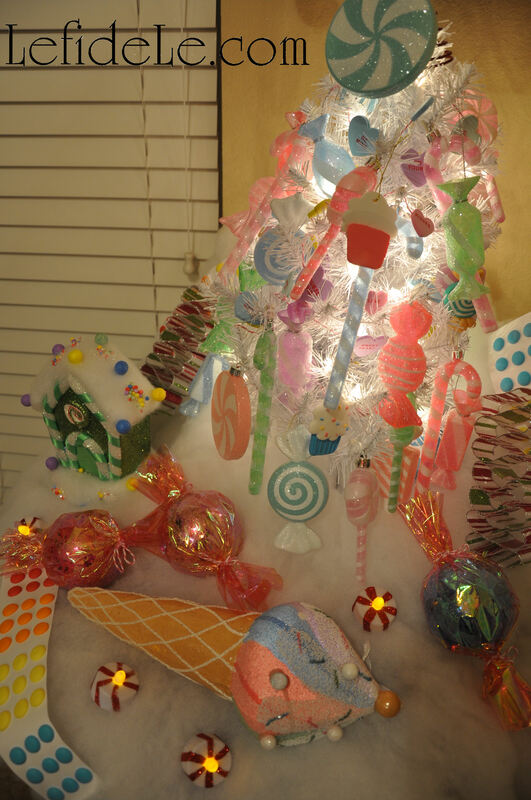 The tree skirt of shimmering purple fabric was repurposed from Mardi-Gras. 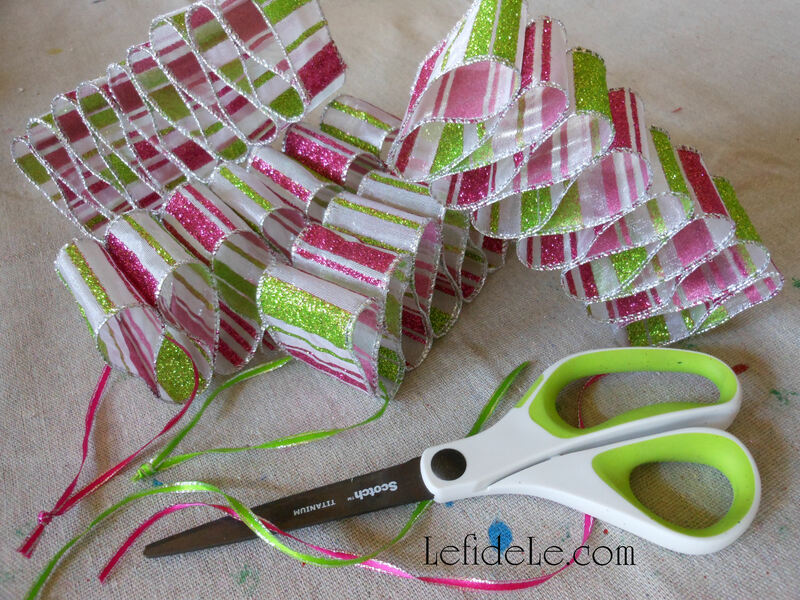 The tablecloth had hand-sewn bead and fringe trimming. 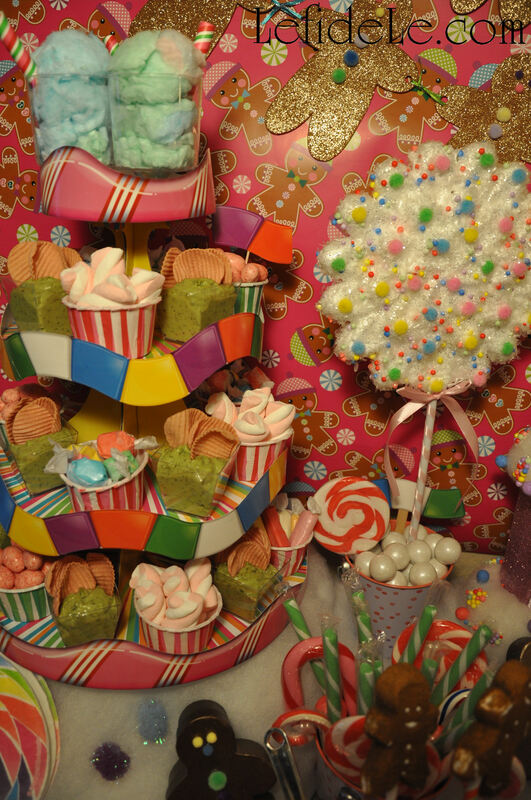 The centerpiece tree was flanked with hand-painted papier-mâché witch hats, and the felt ones featured favors from my foam shapes craft. 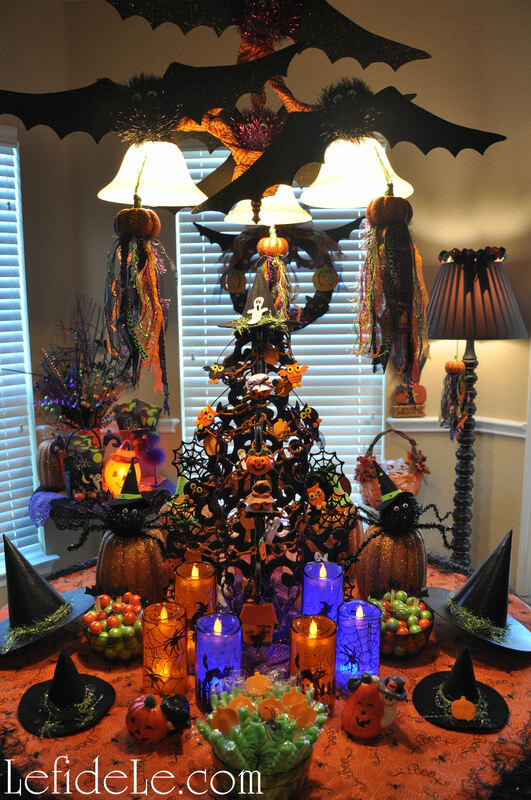 The chandelier was trimmed with ribbon and my friendly bats craft, and then draped with my pumpkin tassels craft. 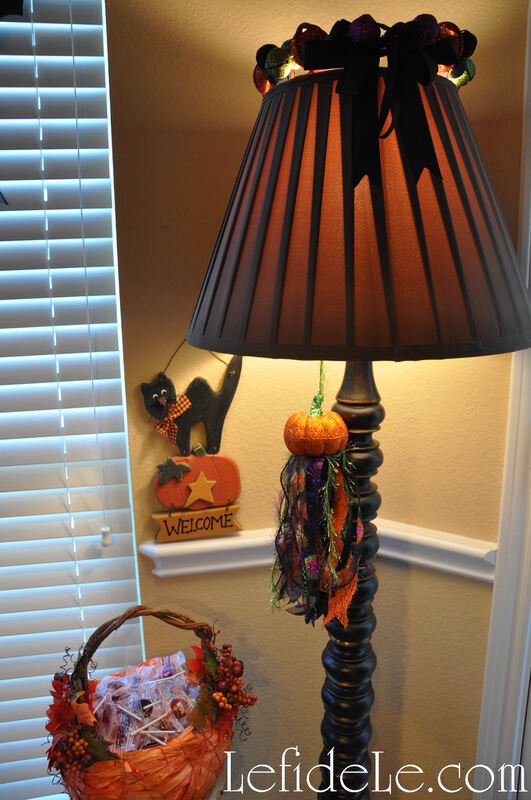 Another pumpkin tassel dangled from lamp. 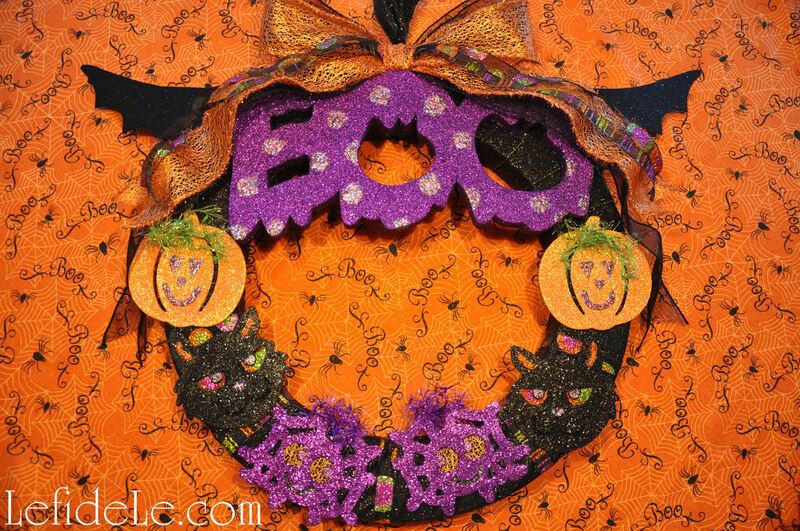 The pictured pumpkin basket will be featured in an article very soon. 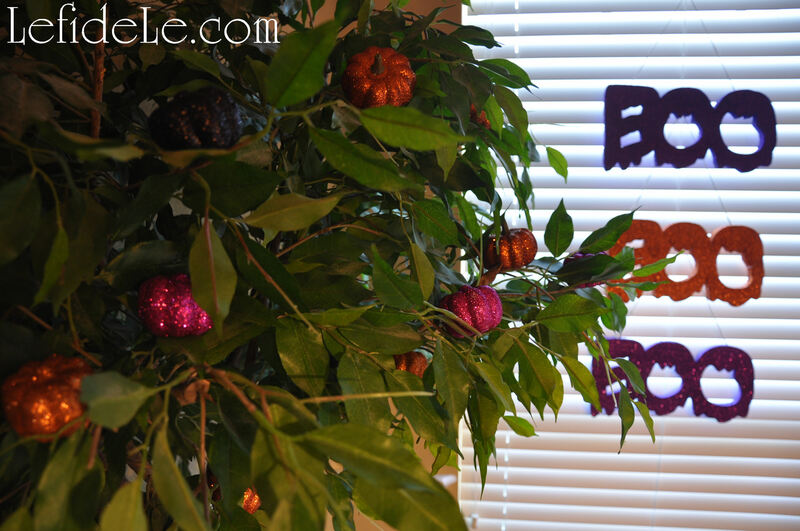 Glittered pumpkins sat snugly in a ficus tree, next to a window hung with glittered “BOO” signs. 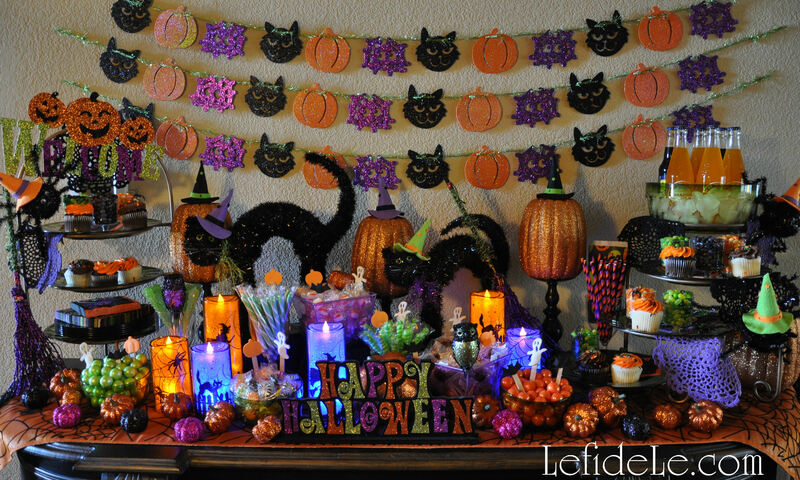 A side table held a glitter pick arrangement and pumpkin lamp that’s been glowing since my childhood. 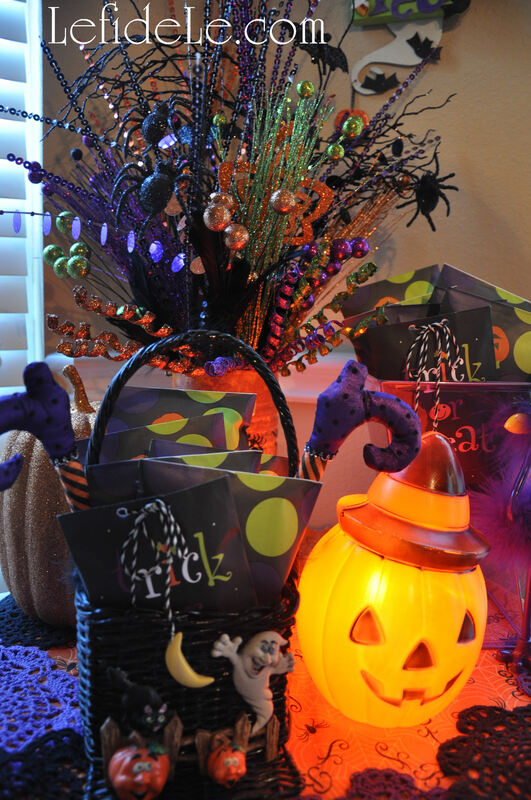 Fabric witch feet were tucked into a vintage basket held with treats. 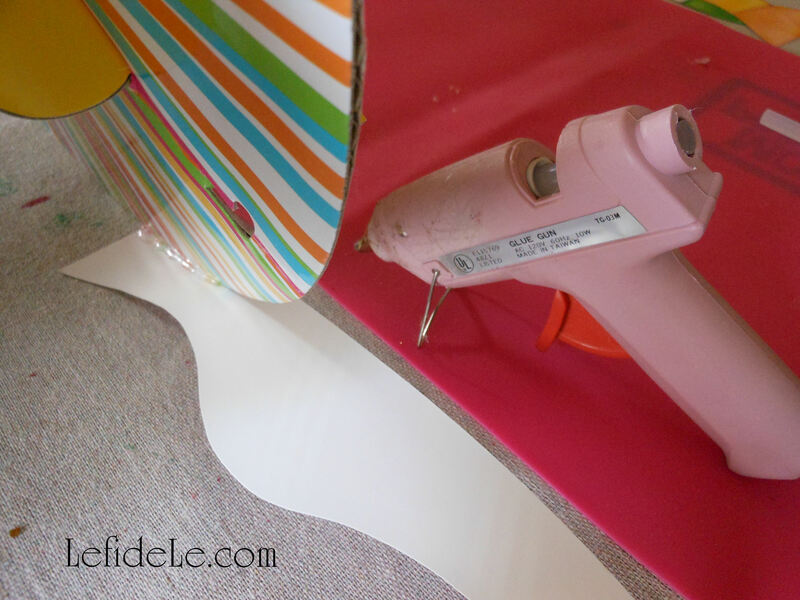 My foam shape sign craft hung in the background. 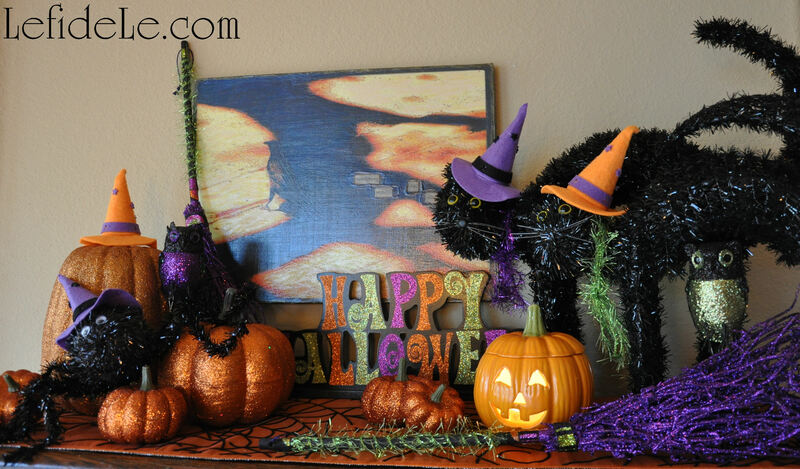 Another surface in the room featured more of the friendly witch menagerie guarding one of my mixed media paintings. 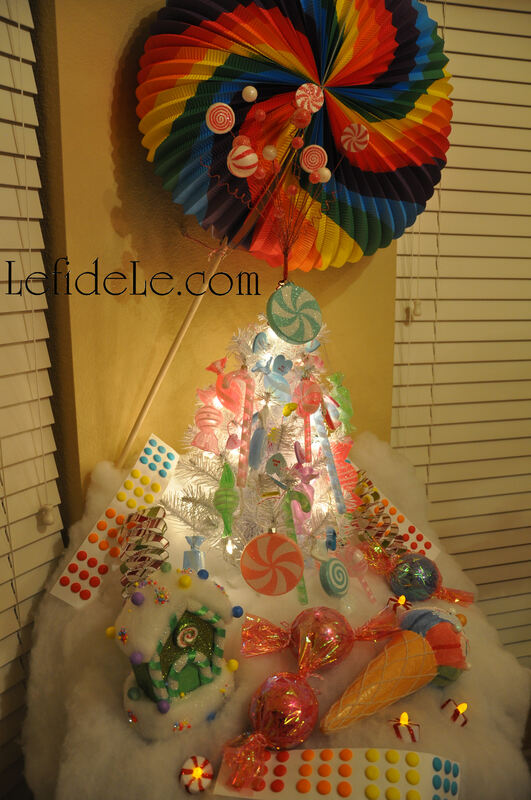 Changing up your artwork seasonally is a great way to feature your whimsical creations. 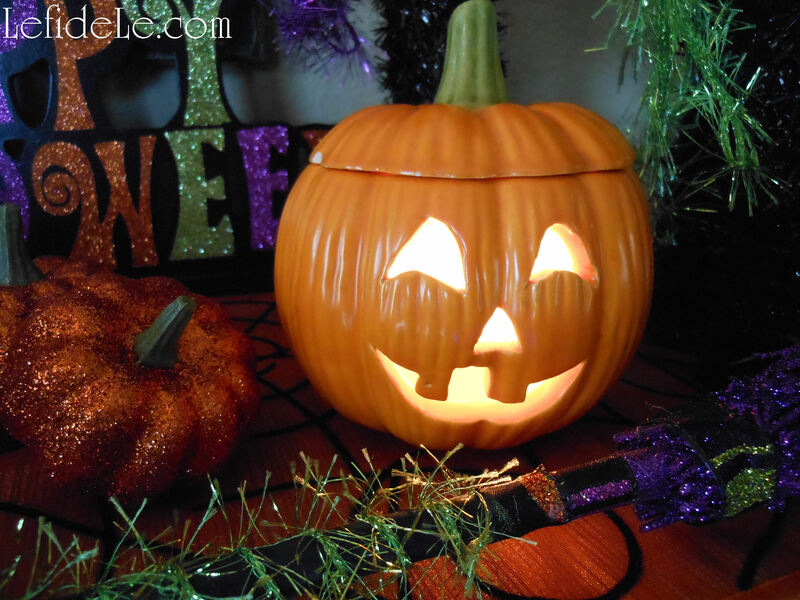 The ceramic pumpkin was made before I was born. 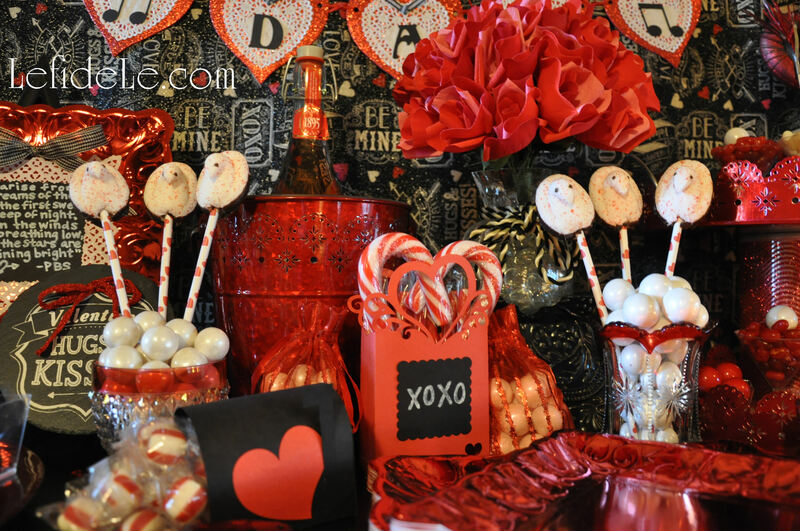 It’s easy to add personal touches with mementos by nestling them into your themed décor. 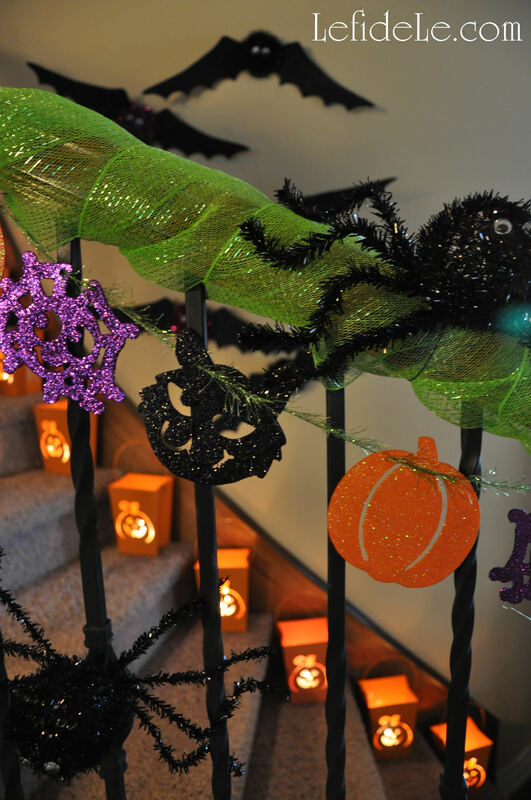 Even the staircase was decorated with foot wide green mesh ribbon, more glittered garlands, glowing luminarias, flying bats, and crawling spiders. 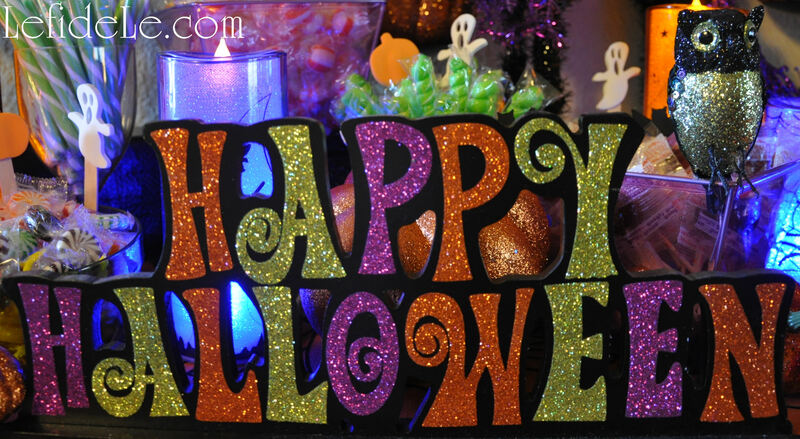 Have a Safe and Happy “Glitter-Ween”!